Pasta–who doesn’t love it? When many of us think of pasta, we typically think of the more popular styles such as spaghetti, penne or linguine, but there are actually dozens of different types of pasta, each with their own special flavor profile, culinary application and even regional origin. But how did pasta actually came to be? Food that is made of flour and eggs or water and molded into strings or other shapes, a.k.a. 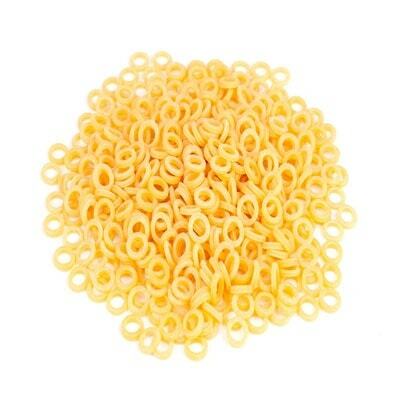 noodles, has been around for millennia. In one of the most popular theories of how pasta came to be in Italy, it is said that Marco Polo, the famous Venetian explorer, brought the noodles he found from China to Italy. This was during the 13th century and the documentation historians refer to is in his renowned book The Travels of Marco Polo. For many, this is how pasta in Italy came to be. Unfortunately, all these stories about the famous explorer bringing pasta to Italy relies heavily on retelling because his book’s original text has long been lost. However, some historians believe that many types of pasta in Italy has been around way longer than that. According to some, when the Greeks founded the city of Naples around the 3rd century BC, the natives in the area already had a dish called “macaria” made of flour made of barley and water that was dried in the sun. And there was even a mention of a pasta-like dish called “laganum” or “laganas,” a known predecessor of lasagna. The Roman politician Cicero, who lived from 106 to 43 BC, mentioned he had a passion for said pasta. Many archaeologists also believe that the earliest types of pasta or noodles were actually created in Central Asia, thousands of years before Marco Polo ever came to the region. And that it traveled westward from there by way of nomadic Arab tribes to Europe. Whichever of the stories may be true, the facts are these: pasta is one of the most beloved food in the world today, and it is indistinguishable from Italian cuisine. Now that we’ve taken a peek on some of the theories behind the origin of pasta, let’s get to to good part, shall we? 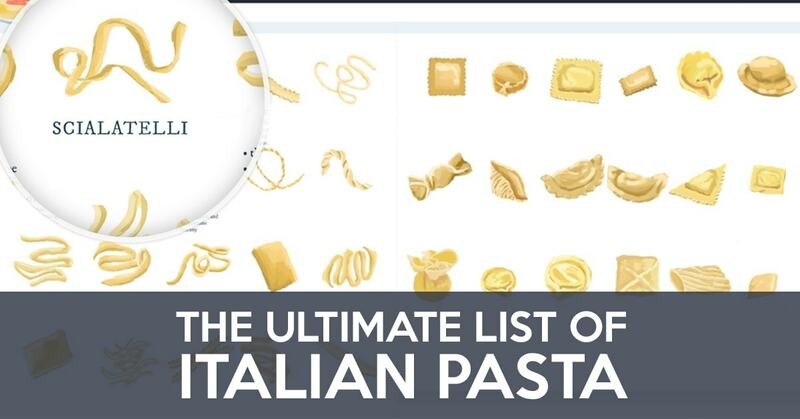 Below is an extensive list of the many different types of pasta commonly used in kitchens all over the world, along with some key facts about each one. Enjoy! Or check out our selection of Italian pasta if you feel hungry right now. 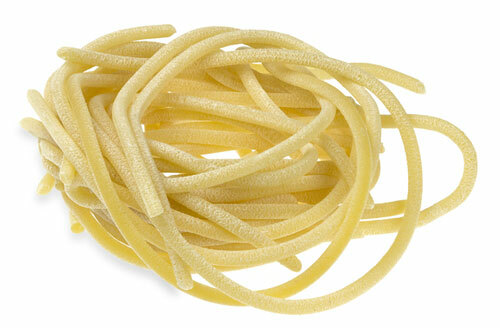 If you can imagine a thicker version of spaghetti with a hole running through the middle, that would be bucatini. In fact, the name of this pasta is derived from the Italian word “buco,” which means “hole.” Bucatini originated in the Italian regions of Naples, Liguria and Lazio, and is typically served with savory items such as pancetta, guanciale (a cured meat) in the traditional bucatini all amatriciana sauce recipe, cheese, eggs, anchovies, and sardines, and with a buttery sauce. 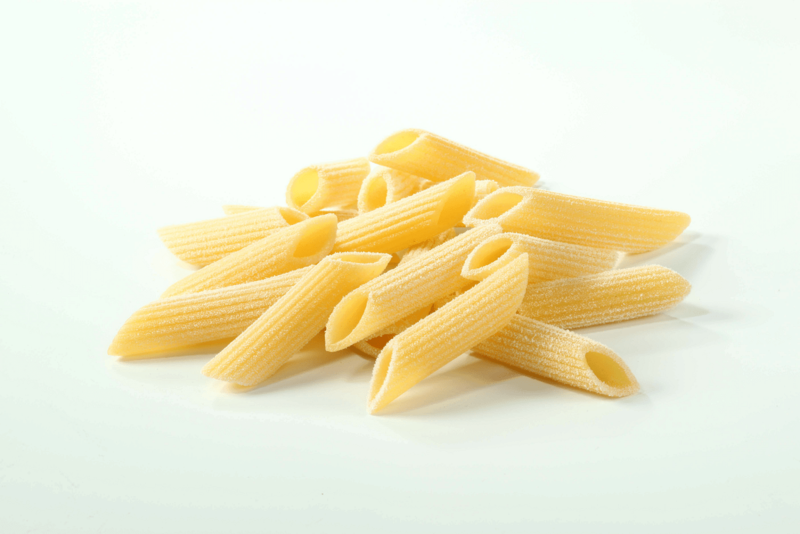 Penne pasta features a small cylindrical shape, and is one of the 10 most popular types of pasta in the world in terms of consumption volume. Born in Sicily and perfected all over Italy, penne is often stuffed with various fillings (e.g., spinach and ricotta) and served in a variety of tomato-based or cream-based sauces, or vegetables like in our penne alla campagnola recipe. 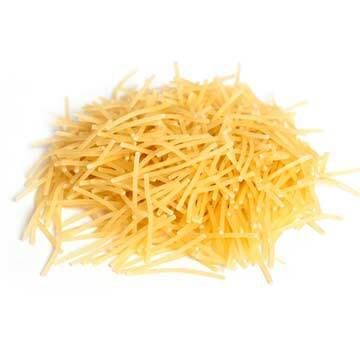 Scialatelli is similar to fettucine and/or linguine in appearance, but with a shorter length. It originated on southern Italy’s Amalfi coast, and is commonly served with various types of fish and seafood sauces. 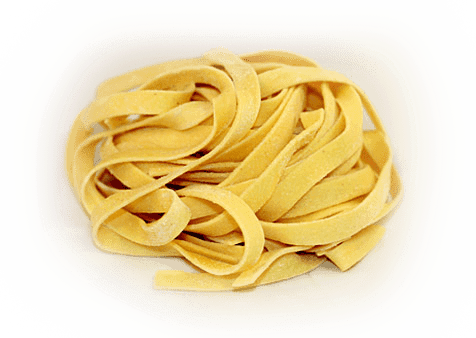 One of the popular types of pasta, it comes in long, flat, ribbon-like strips, and is historically from the Marche and Emilia-Romagna regions of Italy. It is commonly served with pork or beef, as well as ragu alla bolognese sauce. Caserecce is a native of Sicily, but its popularity soon spread throughout the various regions of central and southern Italy. It features a twisted shape that is rolled into somewhat of an “S” shape, and is commonly served with eggplants, ricotta and seafood. 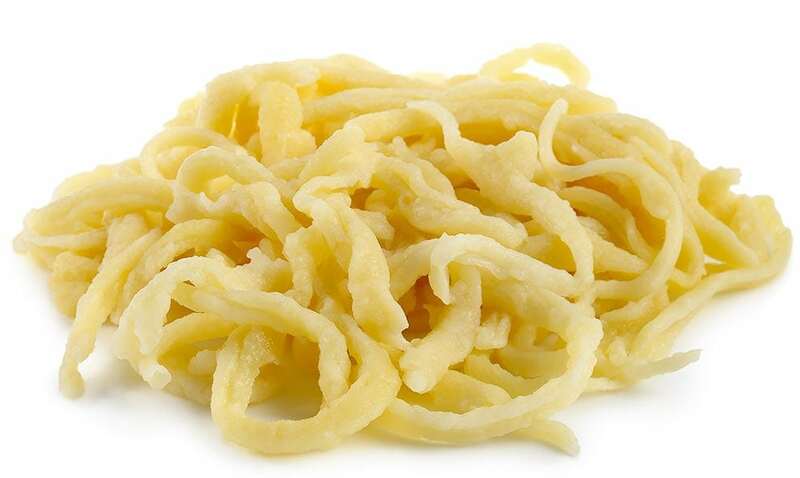 Mafalda originated in the Molise region in Italy, and is reportedly named after Queen Malfada di Savoia, which is why the alternate name for this pasta shape is reginette (Italian for “little queen”). This pasta is cut into flat, long strips and features wavy or ruffled edges, and is often served with Italian sausage or ricotta cheese. 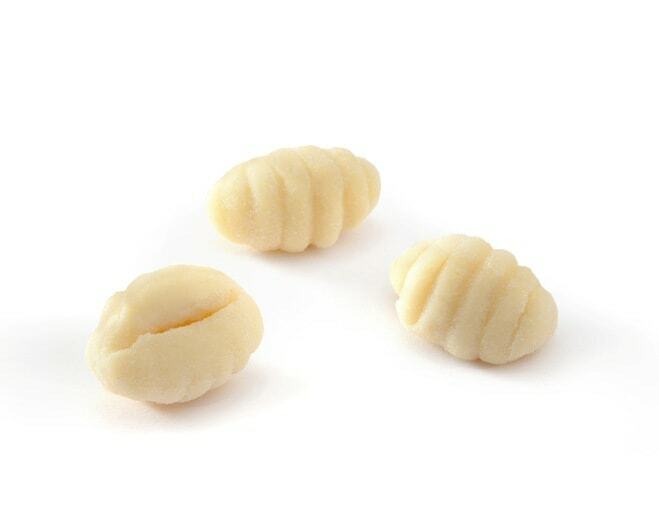 Known as malloreddus in their native land of Sardinia, gnocchetti sardi is a pasta that features a small, compact shape, almost like tiny clamshells. They are often served with meat, like this malloreddus with pork shoulder sauce recipe, or cheese sauces. The exact origin of this popular pasta is somewhat hard to nail down because it has been around since the days of the Roman Empire, but it was definitely popularized in Italy. Gnocchi is a type of dough dumpling that is cut into pieces about the size of a small cork, and it often features potatoes, spinach, ricotta, eggs, or cheese. 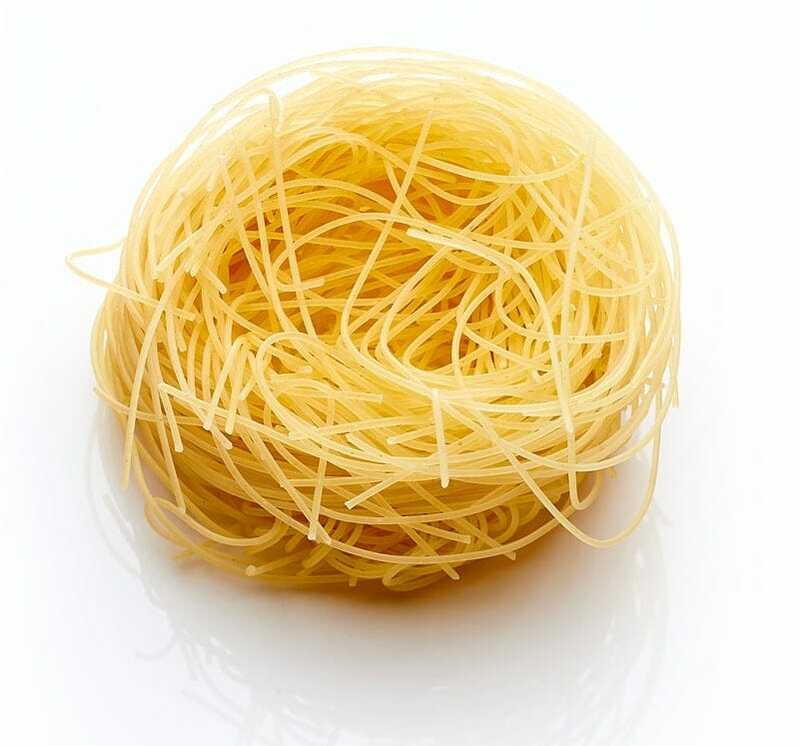 Perhaps one of the most commonly used pastas in the world, spaghetti reportedly originated in China, and was imported to Venice by way of the popular merchant traveler Marco Polo. 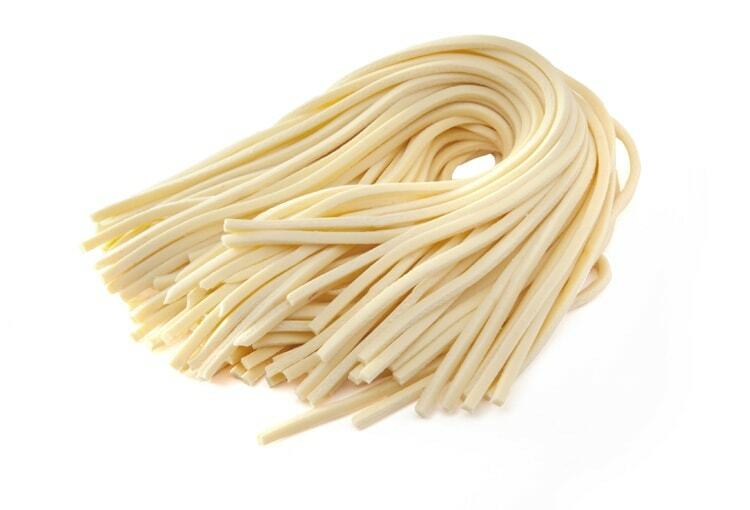 Spaghetti noodles are very long, thin and round-shaped, and are commonly served with a wide variety of sauces, meats and vegetables, including marinara sauce, meatballs and mushrooms. One of the most famous dishes with this type of pasta is spaghetti alla carbonara. Sagne torte is a spiral-shaped pasta that originated in Puglia, Italy, and is commonly served with a variety of mixed meat sauces. 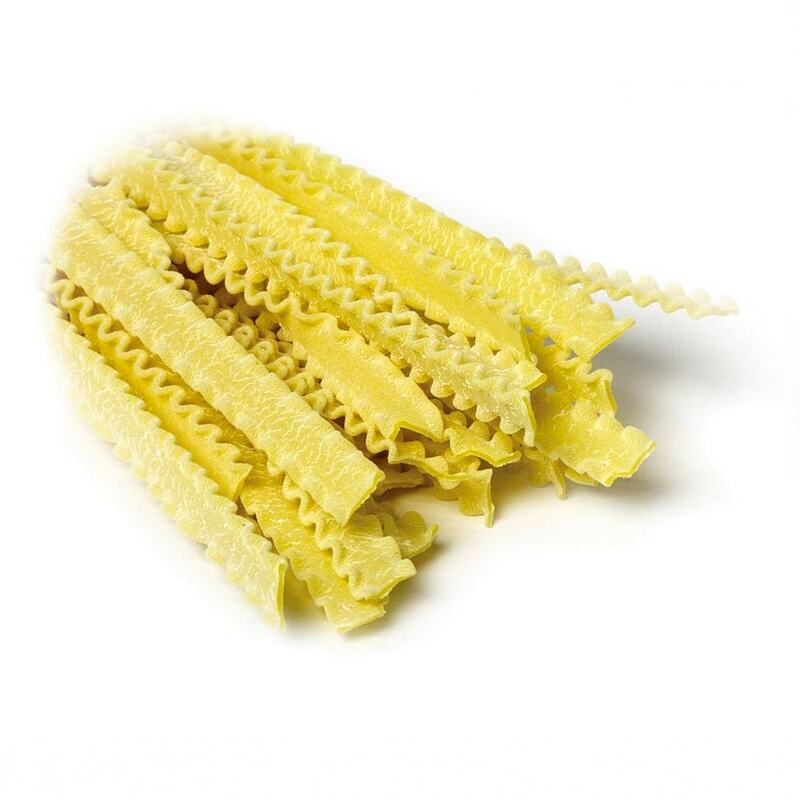 This highly popular pasta style originated in the regions of Calabria and Campania, and features a large tubular shape, almost like slices of a garden hose. They are commonly used in tomato sauce based recipes, like this paccheri with ragù napoletano recipe, seafood sauce recipes or any type of dish with heavy garlic accents. 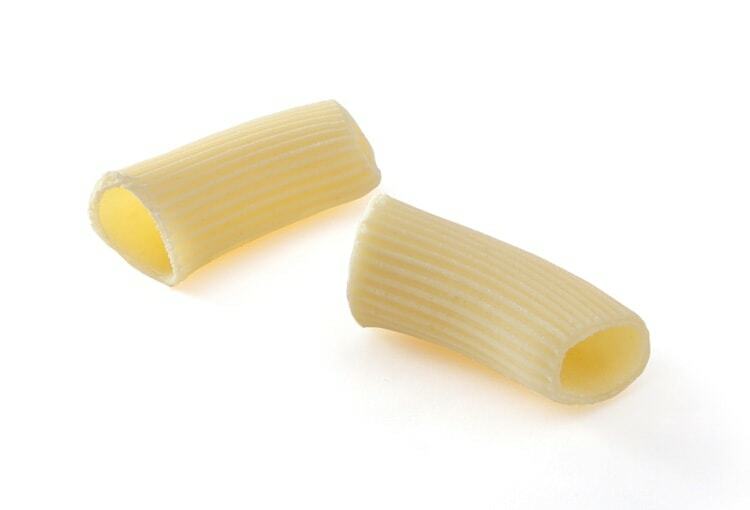 Originating from Naples, tortiglioni features a tubular design with small ridges that run in a slightly diagonal direction down the length of the tube. This not only makes it a beauty to look at, but it serves a great functional purpose as well, as tortiglioni is a perfect match to hold full-bodied sauces of all kinds. 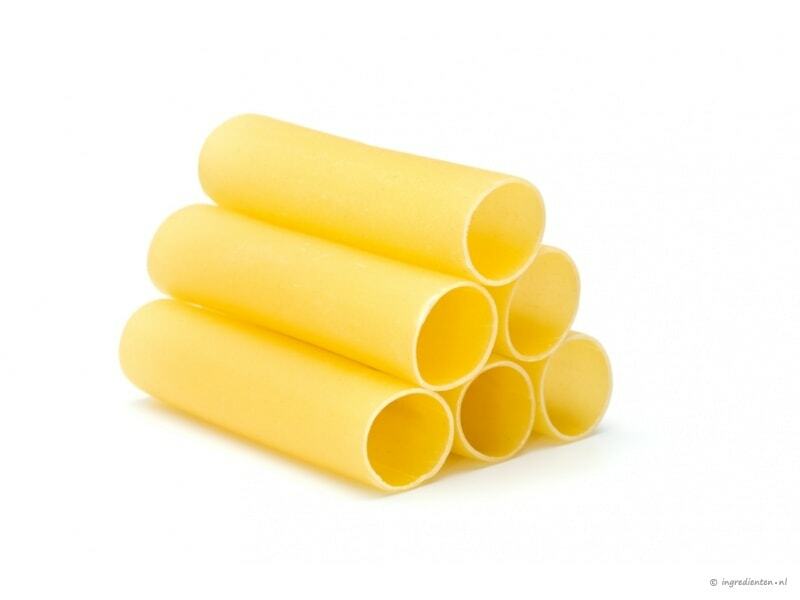 Rigatoni is a large, tubular pasta with vertical ridges that run lengthwise down the tube. It is slightly larger than penne, and is often served with meat ragu, as well as a variety of light and heavy sauces. 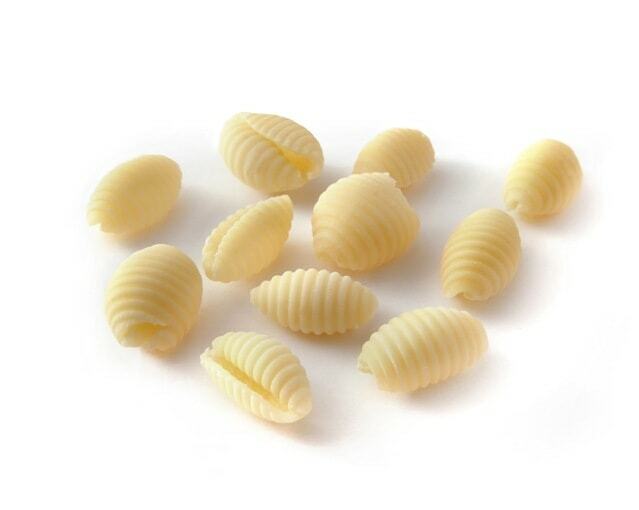 Originally hailing from Naples, ditalini literally means “small thimbles” in Italian, and it’s easy to see why when you look at the shape of this pasta. It is cut into tubes that are comparable to the size of a kernel of corn, and it is often called “short macaroni” due to its smaller size. Ditalini is commonly served with ricotta cheese or broccoli, and is great for use in soups. 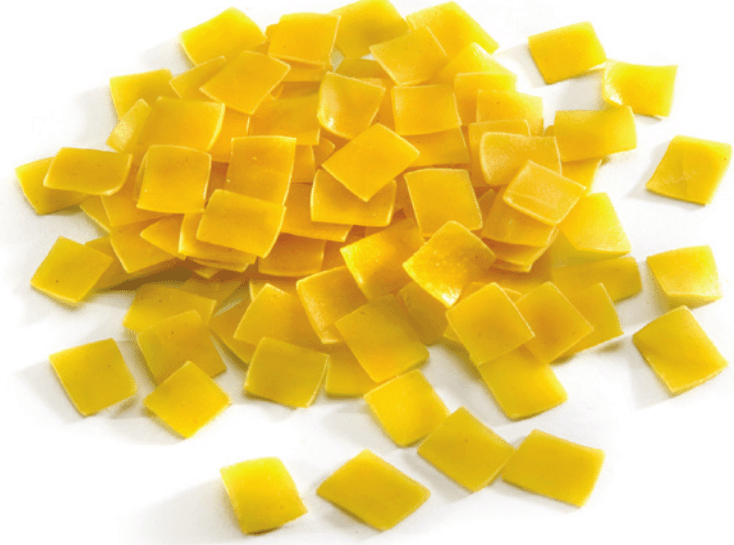 Born in the regions of Emilia-Romagna and Lombardia, farfalle is popularly known as “bow-tie pasta” due to its similar shape, and is commonly used for dishes that call for light sauces, as well as pasta salads. Also known as macaroni, maccheroni is perhaps one of the most popular pasta styles in the world. It originated in northern and central Italy, and it features a small, slightly curved, tubular shape that makes it very versatile. 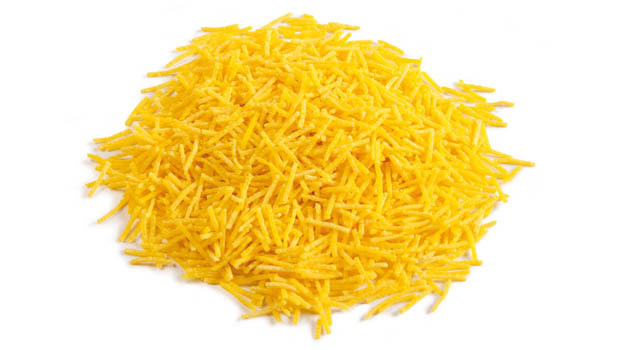 Maccheroni is commonly used in baked pasta dishes, soups, or tossed with cheese or vegetable sauces. 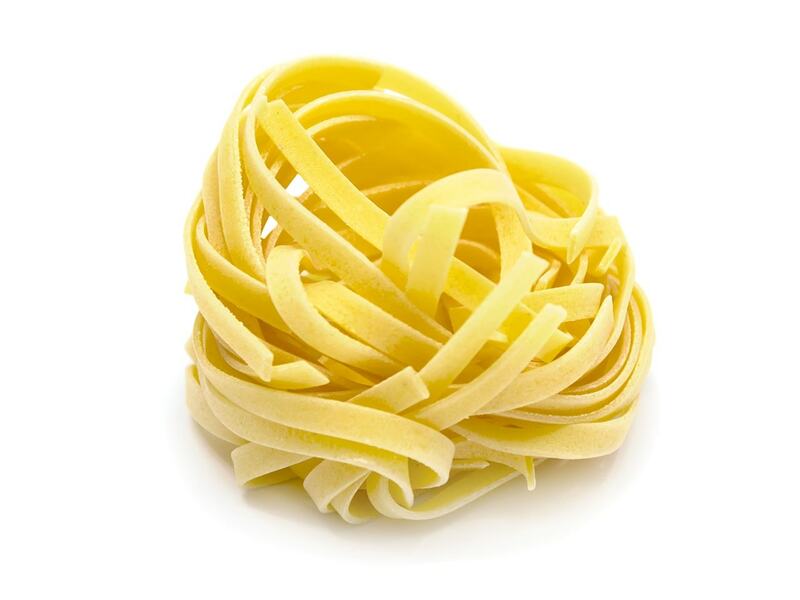 This long, thin, elliptical, ribbon-like pasta originated in the Liguria and Genoa regions of Italy. It is very commonly used in combination with seafood and clam sauce, as well as a variety of red sauces such as arrabbiata or marinara. Nonna Box even recently featured a Tuscan version of it enhanced by truffle! 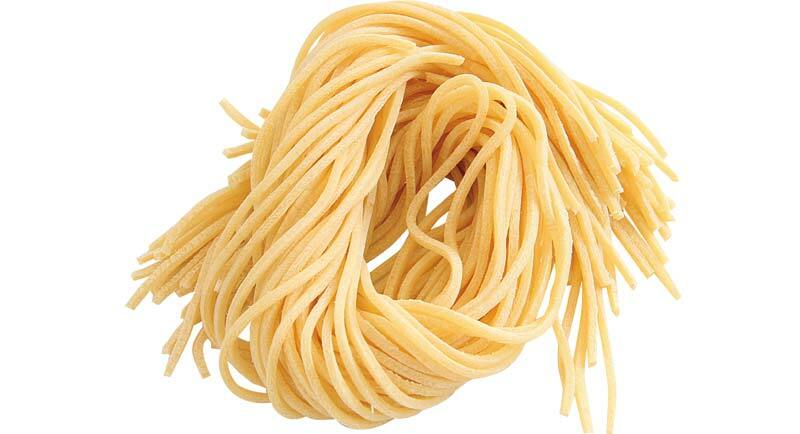 Born in the Province of Siena, Italy, pici is a hand-rolled pasta that looks like a fat version of spaghetti. It is commonly eaten with ragu, garlic tomato sauce, porcini mushrooms, and a variety of game meat (e.g., wild boar, duck, hare, etc.). The origin of this uber-popular pasta shape is somewhat obscure, but legend has it that the Lombardy region played a big role in spreading its popularity. It is a square shaped pasta with ruffled edges, and is often stuffed with various fillings including meat, cheese and vegetables. 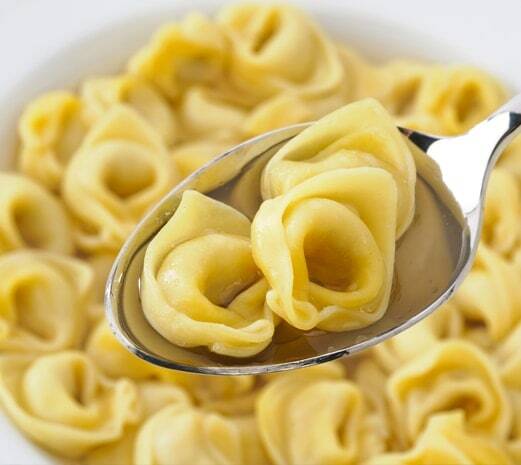 Originating from the Emilia region of Italy (specifically Modena and Bologna), tortellini are a somewhat ring-shaped pasta that is often stuffed with a combination of meat (prosciutto, pork, etc.) and/or cheese. 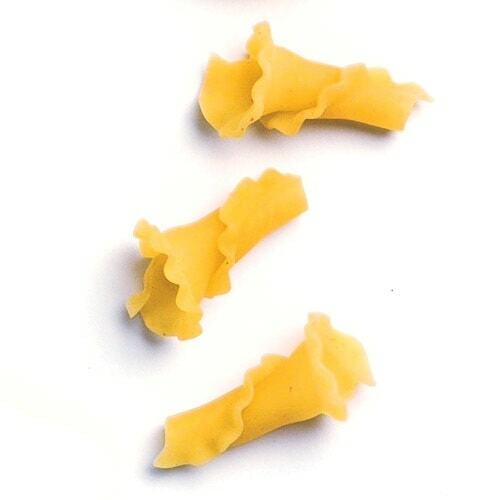 Perhaps one of the most whimsically shaped pastas on the list, capricci comes from Puglia, Italy, and features irregular shapes similar to ocean coral. Capricci is often eaten with thick or thin sauces. This long, thick, corkscrew-shaped pasta originally hails from Southern Italy, and is most commonly served with tomato sauce and cheese. With a centuries-old history rooted in Italy, canule is a long, somewhat thin corkscrew-shaped pasta that is perfect for serving with thin or thick sauces. 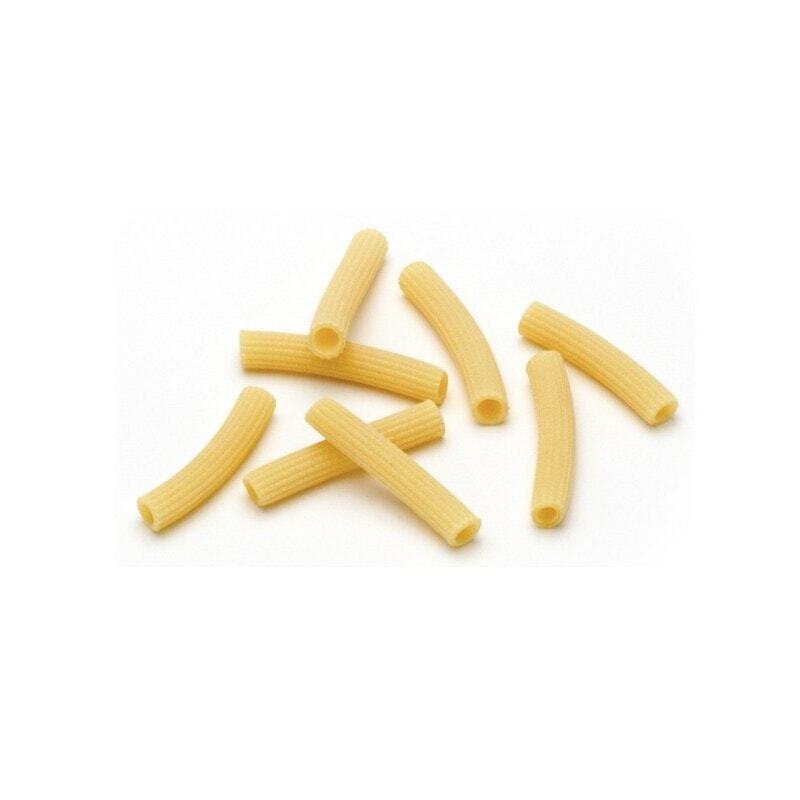 Brought to Italy by way of the Middle East, this small tubular pasta is similar to macaroni, only with a more curved shape and featuring fine ridges. 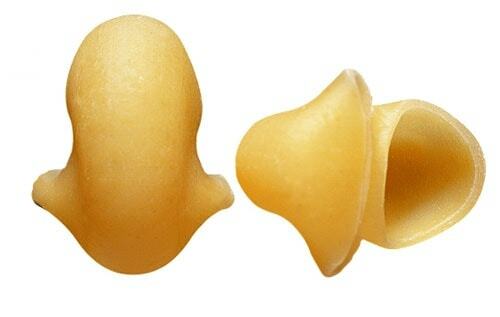 Its rounded shape gives it a snail-like appearance, which is why it is called chiocciole (Italian for “snail”). Chiocciole is perfect for use in soups, or with light or heavy sauces. 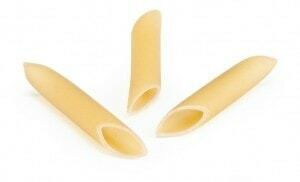 These short-cut tubes of pasta are about 3/8 of an inch long, and originate from Sicily. Ditali is commonly used in soups as well as pasta salads. The word “ziti ” actually means “fiancee” in Italian, because this pasta is traditionally served at Italian weddings. 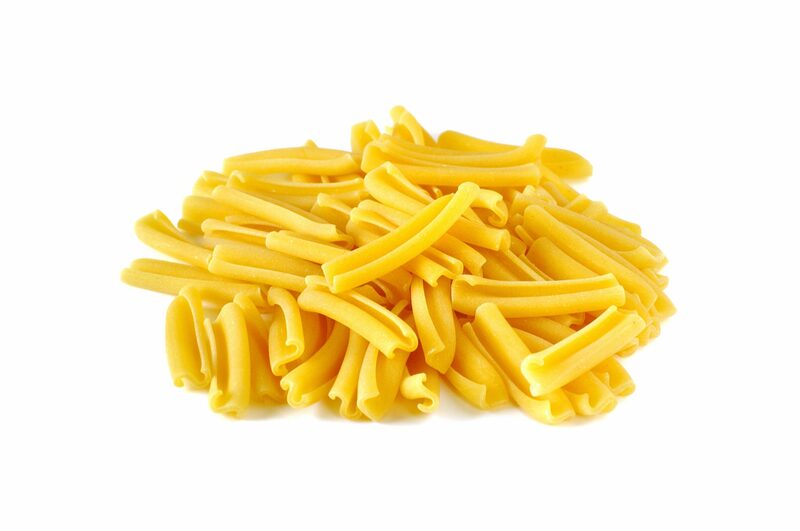 It’s a medium-sized tubular pasta that often functions as a main ingredient in baked casserole dishes (e.g., “baked ziti”), being commonly combined with cheese, meat, sausage, peppers, mushrooms, onions, etc. Born in the Puglia region of southern Italy, fricelli features a rolled tubular shape, and has the consistency of a dumpling. It is typically served with fried eggplant and tomatoes, or with various creamy sauces. Originally from Italy’s Puglia region, orecchiette is a small ear-shaped pasta that is usually served with rapini or broccoli, and is also a favorite to use with tomato or meat sauce and ricotta cheese. In fact, Nonna Box’s Puglia box included this special pasta, along with a traditional recipe from Nonna Ripalta. The region of origin for stelline is somewhat of a hotly debated topic, but suffice it to say that stelline has its roots in Italy. 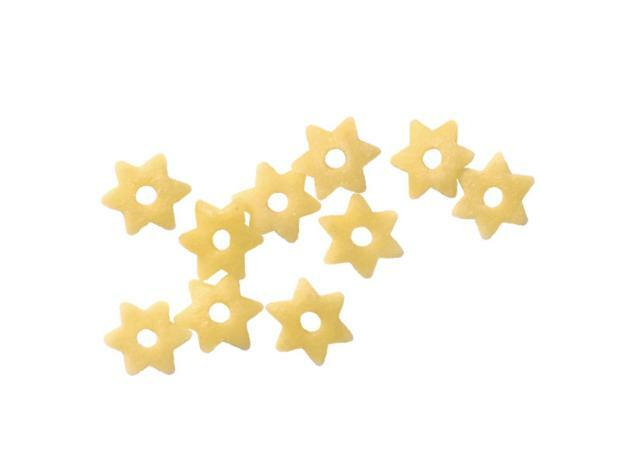 This tiny star-shaped pasta is a preferred choice for use in soups. 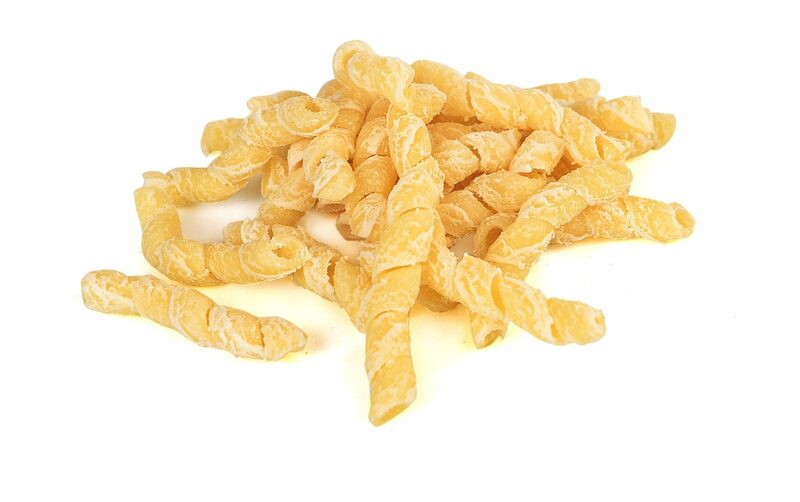 Hailing from the Emilia-Romagna region of Italy, passatelli is a slender pasta with an appearance similar to rice noodles, only a little thicker. It is comprised of eggs, bread crumbs and grated Parmesan cheese,and is usually cooked in chicken broth. Mezze penne is slightly shorter and more slender than regular penne pasta, but it does feature the same ridges. It is enjoyed throughout the regions of northern Italy as well as Campagnia, and is traditionally paired with tomato sauce, or the spicier arrabbiata sauce. Famously known as Garfield’s favorite pasta, lasagna originated in Naples, and features a long, flat, rectangular shape with wavy edges. It is most commonly enjoyed as a baked casserole dish made with layers of lasagna interspersed with various sauces, cheeses and other ingredients. Here’s a step by step recipe for how to make lasagna the traditional way. 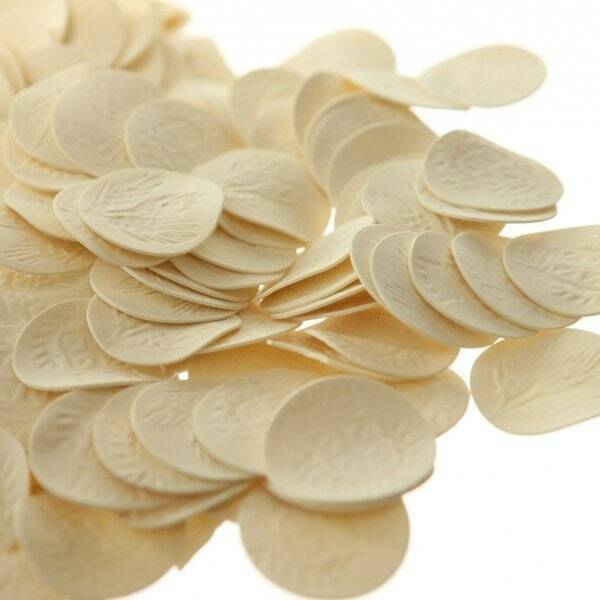 Croxetti originated in the northern Italian region of Liguria, and is shaped to mimic a medallion, often stamped by hand (or machine) to depict intricate designs or patterns. They are customarily served with simple sauces such as meat, mushroom, pesto, fish, or light cream. Nonna Box recently included this relatively unknown pasta in the Liguria box, which also came with a recipe from Nonna Anna Maria that called for the pretty discs to be tastily dressed in the box’s jar of pesto. 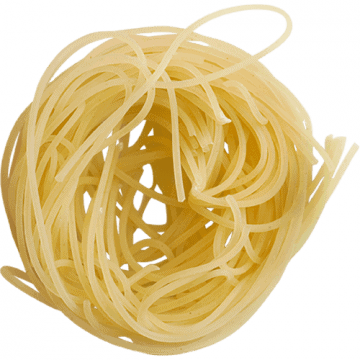 From the Italian word meaning “little worm,” vermicelli has a shape very similar to spaghetti, but could be thicker or thinner depending upon where it is produced. As with other types of pasta, it is commonly served with a wide variety of sauces, both thick and thin. 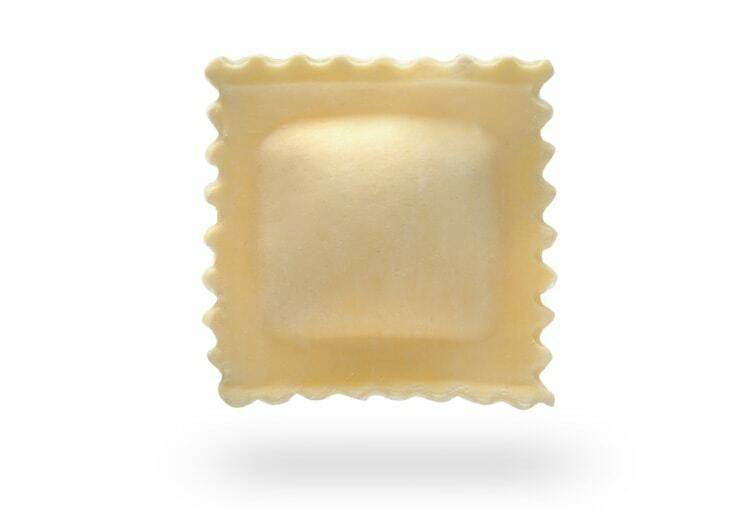 Hailing from the Piedmont region of Italy, this square-shaped pasta typically measures one inch on each side. Like other types of pasta with filling, it is commonly stuffed with meat or vegetables. Similar to tortellini but larger, tortelloni was reportedly born in the region of Emilia, and has a dumpling-style consistency. 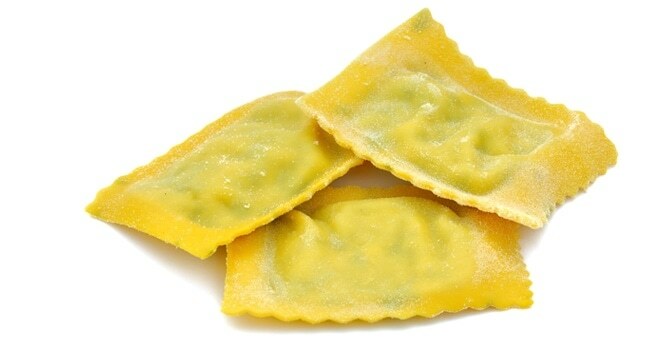 Tortelloni is most often stuffed with ricotta cheese and various leafy vegetables such as spinach. 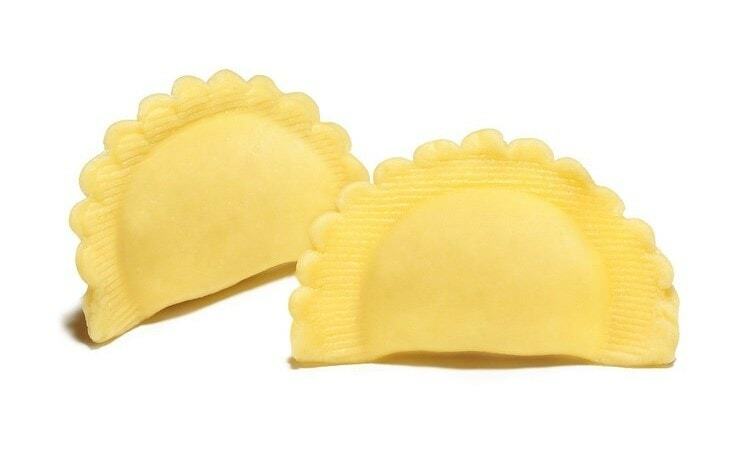 Originating in the Emilia-Romagna region of Italy, this square-shaped pasta is very similar to ravioli, and is typically stuffed with meat, cheese or mushrooms. 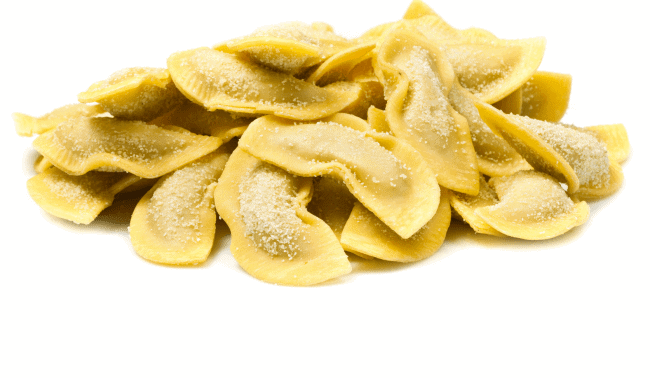 Tortelli is also often served with bolognese sauce or melted butter. Derived from the Italian word meaning “little cat whiskers,” filini definitely has a shape that is similar to its namesake, being very small and thin. It is most commonly associated with Italy’s Puglia region, and is typically added to soups as a thickening agent. 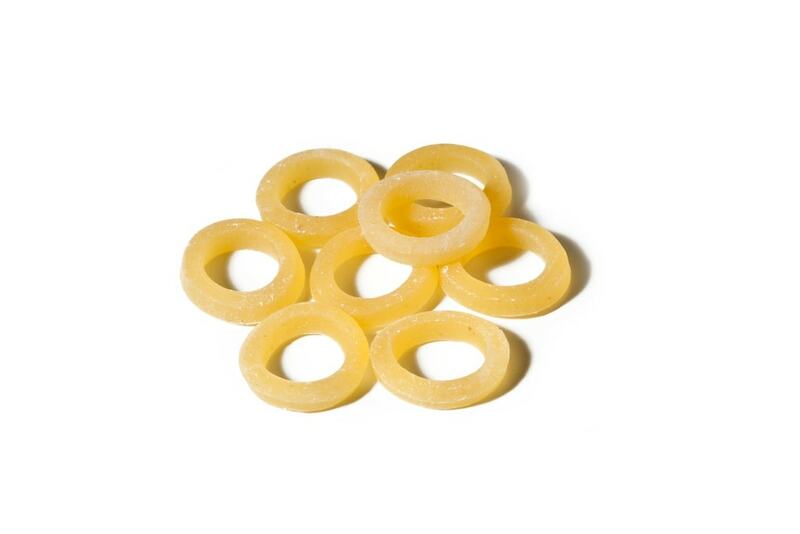 These small, thin rings of pasta have been immortalized in foods such as Spaghetti-O’s, but anelli has a history that goes back far beyond the days of Chef Boyardee. Originating in Sicily, anelli is most often enjoyed in soups and pasta salads. 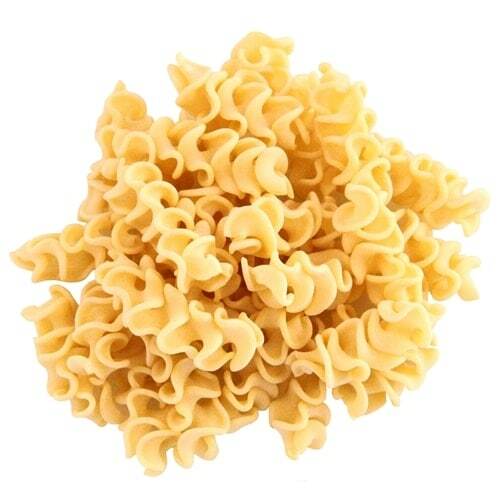 This pasta is basically a smaller version of anelli, being about one-fourth of its size. Also hailing from Sicily, anellini is most commonly used in soups, pasta salads, and in combination with meat ragu. 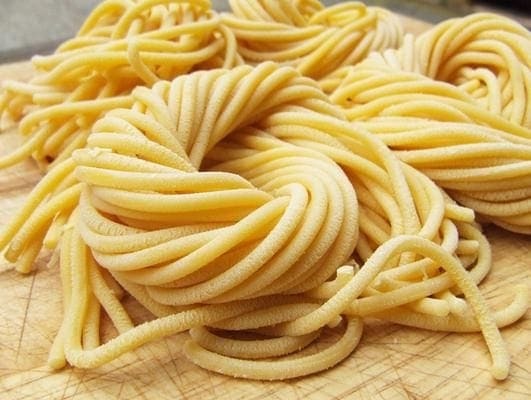 This long, thick, tubular, extruded pasta has Venetian roots, and is commonly made from buckwheat or whole wheat flour. Bigoli is typically enjoyed with various thick or meat sauces, with one of the most popular being duck ragu. 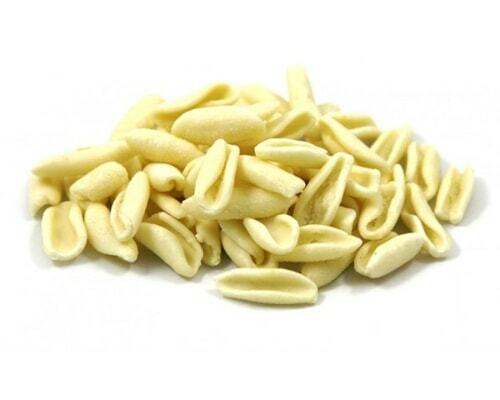 Common to the Emilia-Romagna, Umbria, Marche, and Tuscany regions of Italy, strozzapreti is a hand-rolled pasta that is similar to cavatelli due to its hot dog-bun shape, but it is slightly more elongated, and features a light twist. It is commonly served with cream or meat sauces. Similar to spaghetti but with a flatter, slightly convex cross-section, bavette comes from Genoa, and is typically served with traditional pesto sauces, or with vegetables. 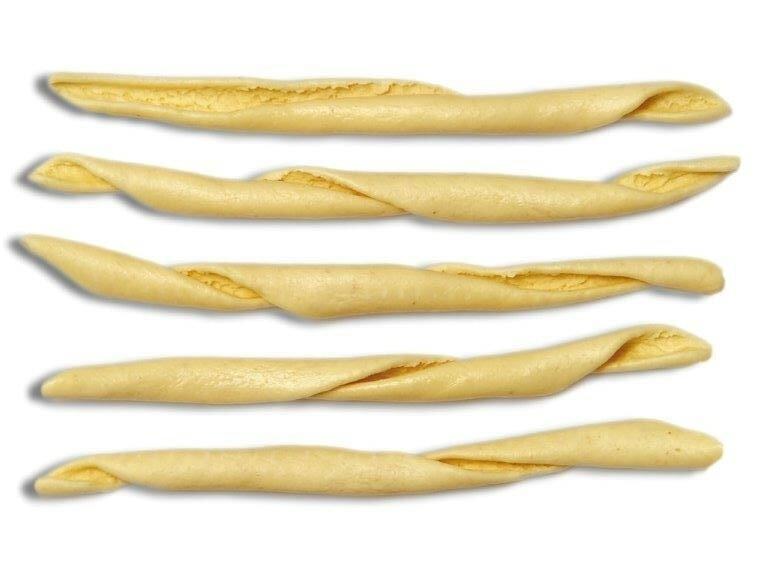 Rooted in the regions of Liguria, Marche and Emilia-Romagna, tagliolini is a long, ribbon-like pasta that is similar to fettuccine, and measures about a quarter of an inch wide. Tagliolini is typically served with various sauces, with one of the most popular being bolognese sauce. 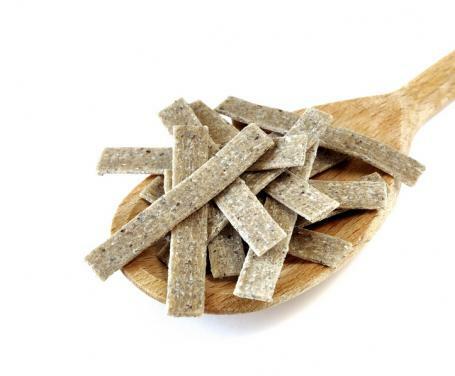 The Lombardy region in northern Italy lays claim to the origin of pizzoccheri, which is a flat, short, ribbon-like pasta commonly made from a combination of buckwheat and whole wheat flour. Among the most unique types of pasta, it is most typically used in preparations that include greens, potatoes and cheese — a wildly popular recipe that Nonna Carla shared in the Lombardy Nonna Box (and which made use of the box’s batch of pizzocheri!) – here’s the traditional recipe for pizzoccheri alla Valtellinese. Abruzzo, Italy, is the place of origin for this particular pasta, which has a shape similar to spaghetti but with a flatter cross-section. What makes it special — and gives it its name — is that it’s made using a musical-like instrument called a chitarra (meaning guitar), which must be strummed to release the freshly cut strands. 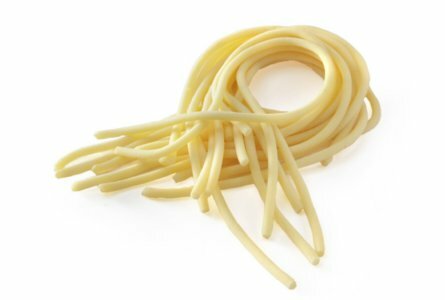 Spaghetti alla chitarra can be served with a wide variety of meat and cream sauces, and can tasted in the Abruzzo Nonna Box. Taglierini is another name for tagliolini (described above). It should be noted that taglierini is often served with butter and truffles (a recipe known as tajarin), or with a roasted meat sauce. 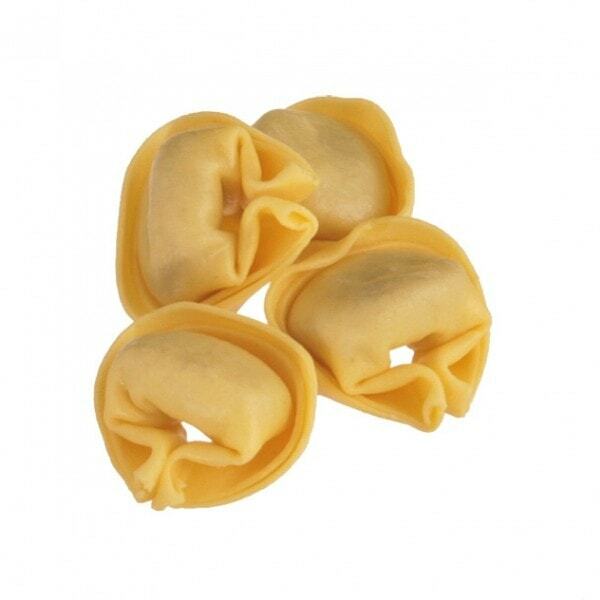 Trenette is a dried, narrow, flat pasta that is commonly associated with the regions of Liguria and Genoa in Italy. It is often served with a pesto sauce in a traditional preparation known as trenette al pesto. Reportedly first created in Naples, Italy, by the famed chef Nicola Federico, cannelloni is a tube-like or cylindrical pasta that usually measures three to four inches in length, and is often stuffed with a cheese, meat, vegetable or fish filling. 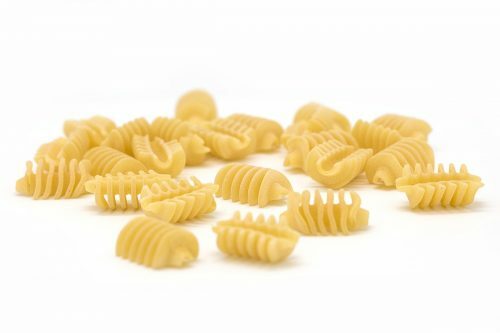 Born in southern Italy and named after the Italian word for “corkscrew,” cavatappi is a hollow, spiral-shaped pasta that measures about one inch in length, and sometimes features ridges or grooves on its surface. 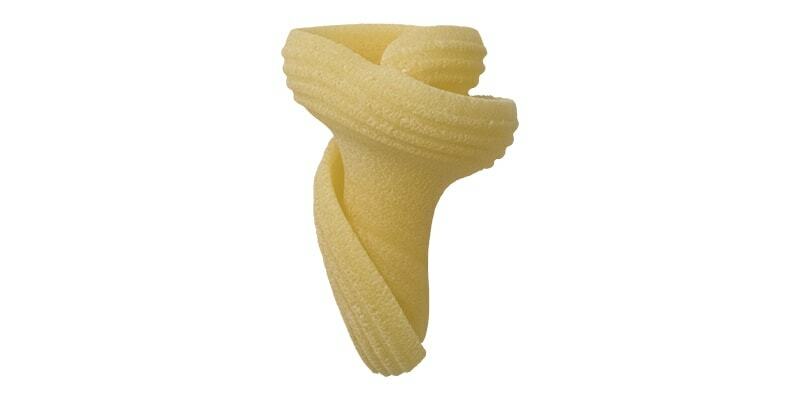 The famous pasta brand Barilla calls this shape Cellentani in honor of a famous Italian singer of the 1960s, Celentano. Cavatappi is typically served in tomato-based sauces, and is often paired with cheeses such as provolone, mozzarella and Parmesan, or serve it with our summery caprese pasta salad recipe. 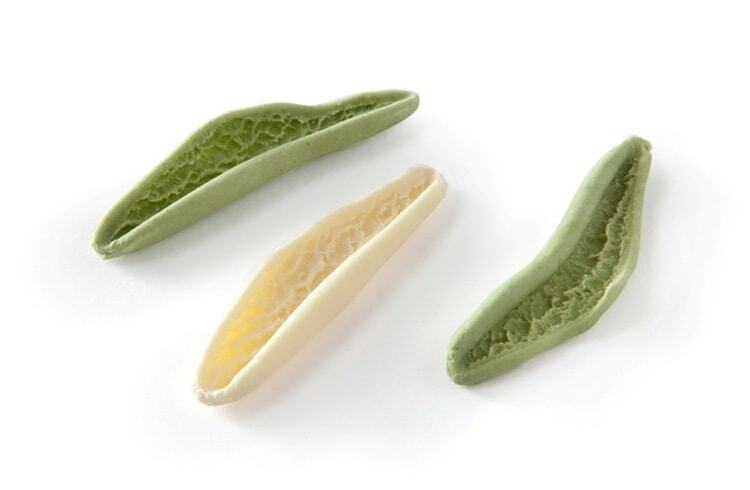 Made from a flat, square pasta noodle that has been rolled into a tubular shape, garganelli has its roots in the Romagna region of Italy, and is known for its distinctive grooves that are formed by rolling the pasta tubes over a wooden comb. Garganelli is frequently enjoyed served al prosciutto e piselli — that is, in a dish that features a mixture of onions, peas, and salt-cured ham. Cavatelli is named for the Italian verb cavare, which means “to hollow out or carve,” and that’s exactly what this pasta of southern Italian origin looks like–a small, hollowed-out shell, similar to a hot dog bun. One of the tastiest types of pasta, cavatelli is most commonly enjoyed in combination with ricotta cheese and tomato sauce, or with the very famous recipe for cavatelli and broccoli. 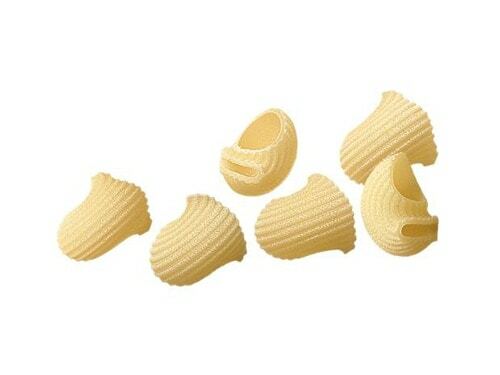 This small, seashell-shaped pasta originates from Italy, and is one of the most popular pasta shapes in the region because it is specifically designed to hold more sauce. Common applications for conchiglie include pastas, soups and casseroles. Originating from Italy’s Puglia region, foglie d’ulivo is a type of pasta that is handmade to resemble the shape of olive leaves. It is typically served with a creamy olive sauce, or tomato sauce with basil. 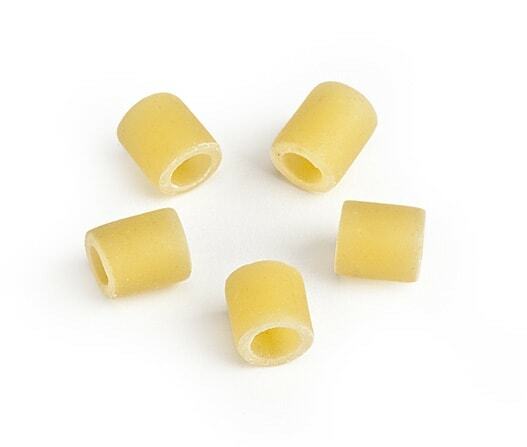 Similar to other types of pasta such as chiocciole, lumache are small, snail-shaped pasta shells that typically feature one crimped end to better hold the sauce. They find their roots in Sicily, and are usually enjoyed with slightly heavier, chunkier sauces. 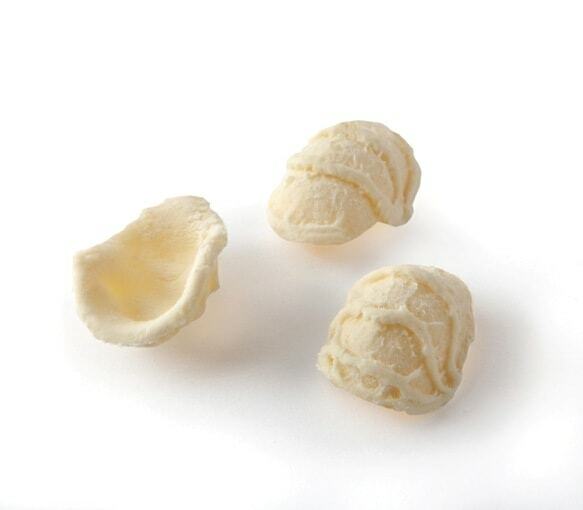 This hollow pasta from north-central Italy also features a curved shape that resembles a snail shell, but with a flattened opening at one end. Pipe pairs well with chunky meat, vegetable or cream sauces. 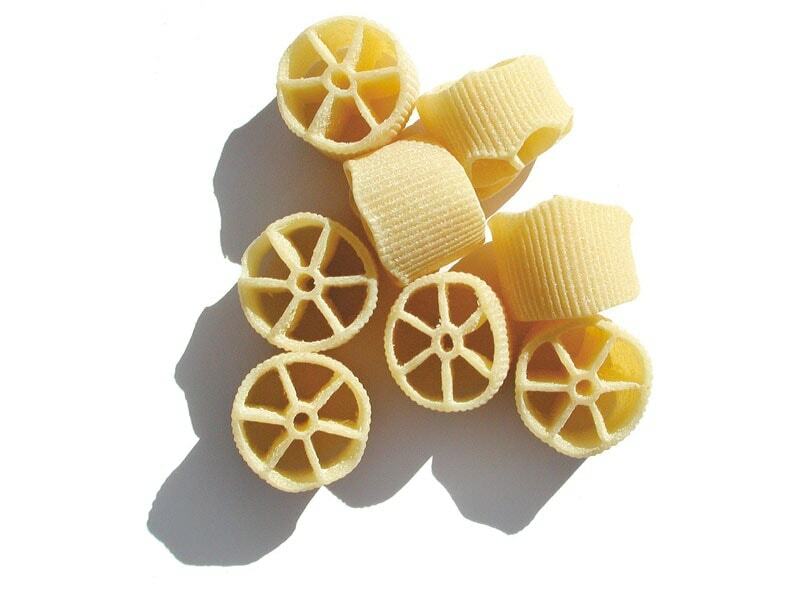 One of many unique types of pasta, this fun wagon wheel-shaped pasta originated in northern Italy, and is commonly used in dishes with either a tomato-based or cream-based sauce. 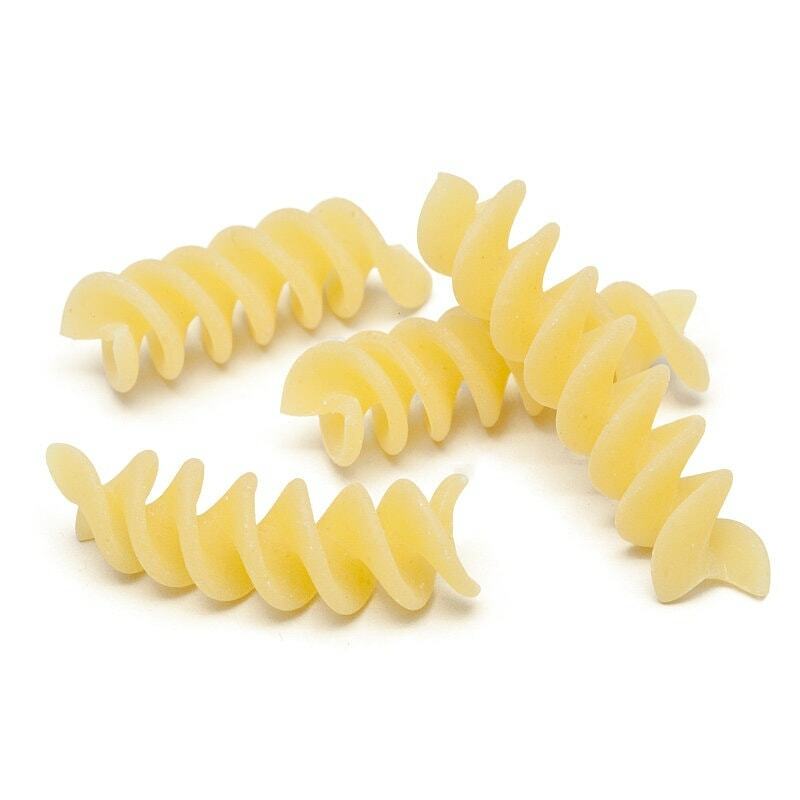 There has been some slight confusion over the difference between rotelle and rotini, as several pasta brands produce corkscrew-shaped pasta named rotelle, but the actual rotelle pasta is shaped like wagon wheels. 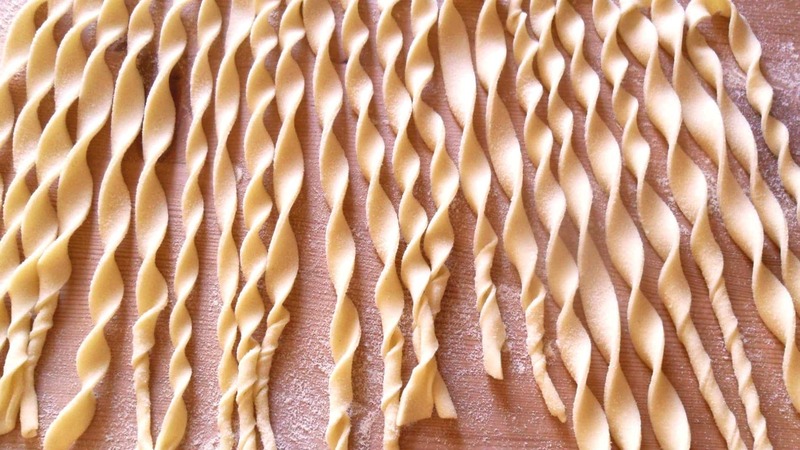 Hailing from Liguria in northern Italy, trofie is a thin, short, twisted pasta that is typically rolled by hand into interesting squiggly shapes. The traditional Liguran application for trofie is to serve it with a basil pesto sauce, but it is also commonly enjoyed with light tomato sauce as well. 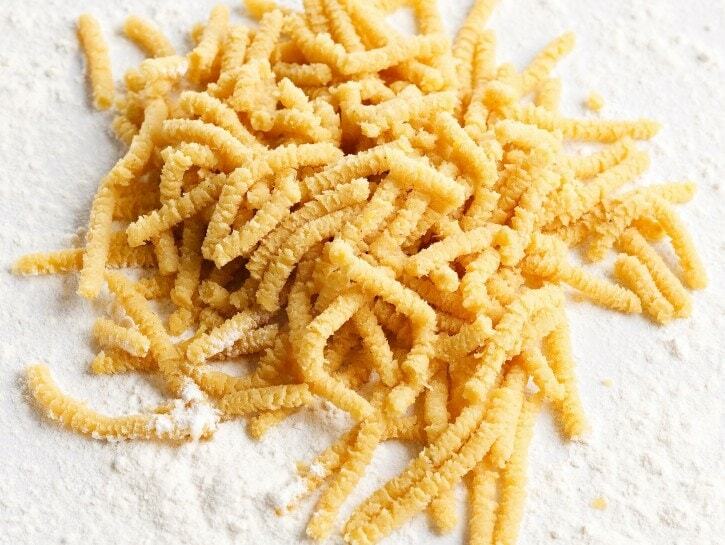 This Sardinian-born pasta is similar to Israeli couscous in size and shape, and is comprised of semolina dough that has been rolled into small balls that are roughly 2-3mm in diameter. Fregola is commonly prepared with clams and tomato sauce, a recipe from Nonna Antonia, which was included in the Sardinia Nonna Box, along with some fregola, of course! 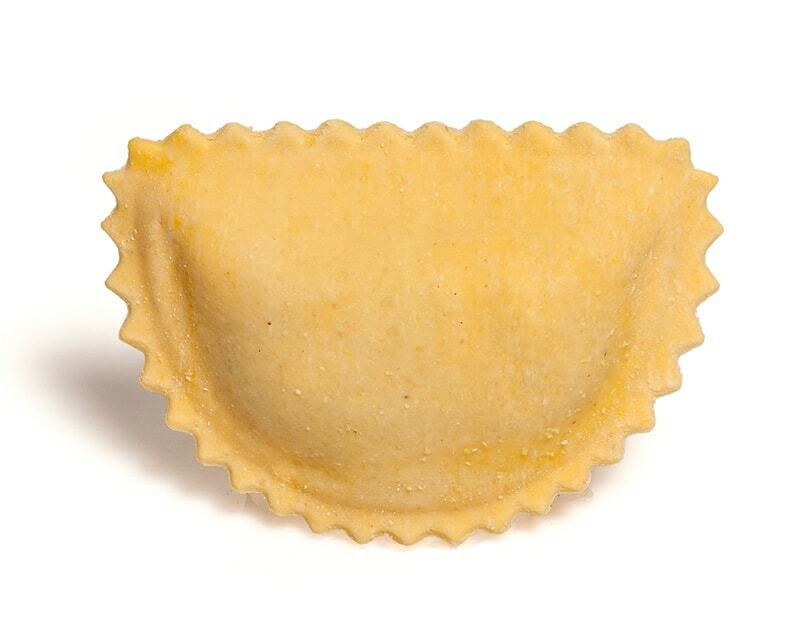 Reportedly born in the Emilia-Romagna region of Italy, this small, flat pasta often comes in a square or triangular shape, and is most commonly used in thin broth soups. 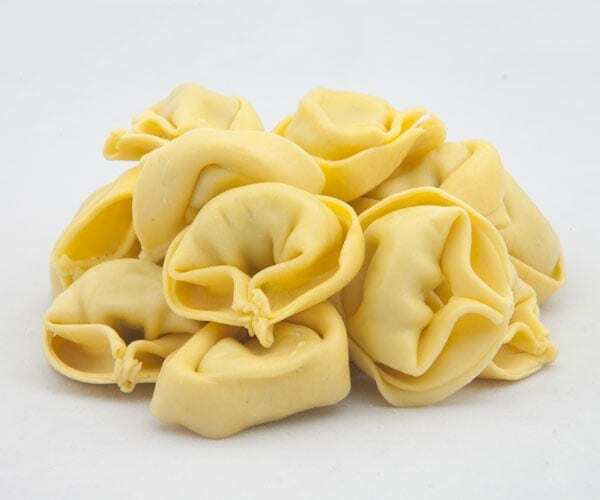 Originating from the ancient town of Modena in Italy, cappelletti is named after the Italian word meaning “little hat,” and its shape definitely takes on this resemblance. 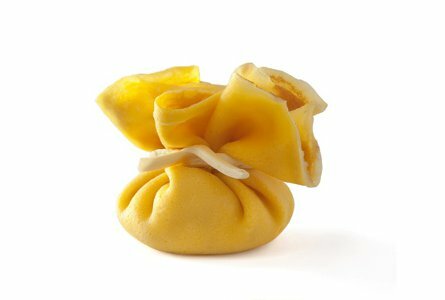 As a dumpling-style pasta, cappelletti is stuffed with meat, and is typically served in a rich chicken or capon broth. Believed to originate from Sicily, fagottini is Italian for “little bundles,” which is an apt description of this randomly shaped pasta. Fagottini is typically stuffed with vegetables such as green beans, carrots and onions, as well as olive oil. 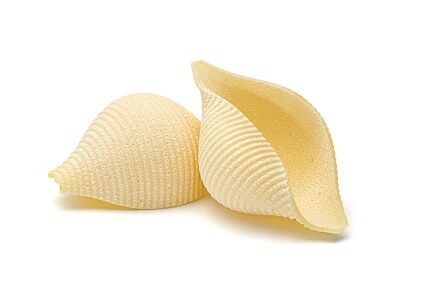 From the Italian word meaning “half-moons,” mezzelune is stuffed pasta that is semi-circular in shape. It originated in Tyrol, an autonomous region of northern Italy, and is typically stuffed with Bitto cheese, eggs, milk, and white pepper. Mezzelune is normally served with a sauce comprised of porcini mushrooms, white wine and sweet butter. Unlike most types of pasta, Spatzle originated with the Swabian people of southwestern Germany. 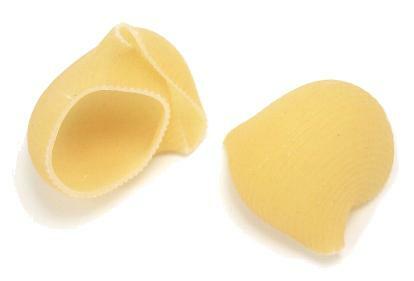 It is an egg-based pasta that is typically round in shape, but it can be irregularly shaped when handmade. Simply comprised of eggs, flour and salt, spatzle is often served as a side dish with butter, or topped with gravy or creamy sauce. 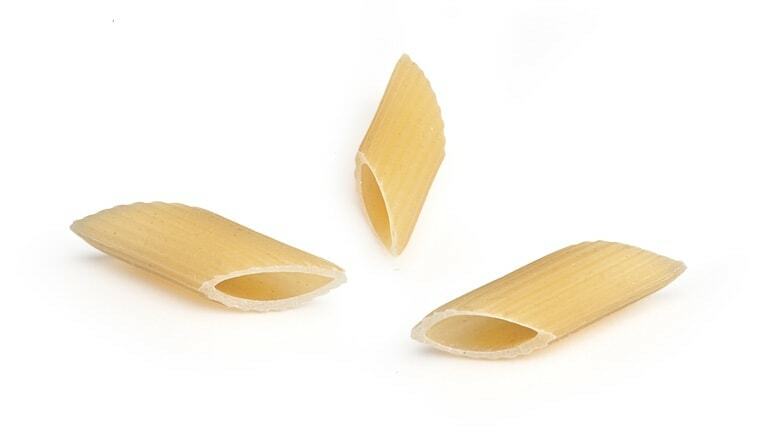 If you were to cut off the angled edges of penne pasta, you would basically have sedani. Although its origins are unknown, it is reasonable to assume that it originated as an offshoot of the Sicilian-born penne. Sedani is commonly served with tomato sauce, but it is also a favorite when served plain with cheese or butter. Hailing from the central-southern region of Tuscany in Italy, pappardelle is flat, ribbon-style pasta that is cut into a very broad shape, not unlike wide fettuccine. Pappardelle is among the types of pasta that is an excellent match for a wide range of sauces, from meat to shellfish to vegetables, or in this pappardelle recipe with artichokes, fava beans and prosciutto. This highly popular pasta has somewhat enigmatic origins, because it goes by many different names in various regions of Italy, however it seems that fettuccine pasta is mostly used in Rome. 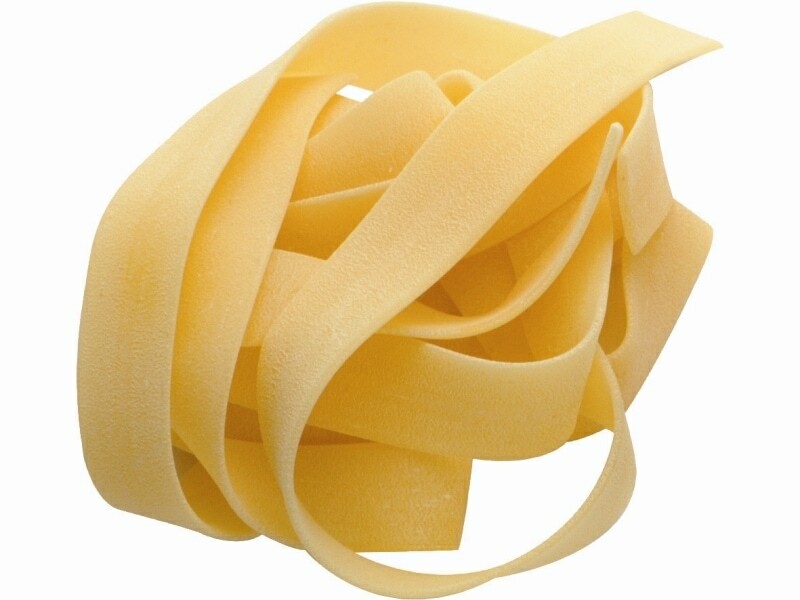 It is a long, flat, ribbon-like pasta with a decent thickness, typically measuring 10 inches long and about 1/4 of an inch wide. Fettuccine is used in all kinds of culinary applications, here’s a fettuccine pasta recipe with cherry tomatoes and bell peppers, but is most commonly known outside of Italy for its use with creamy Alfredo sauce. 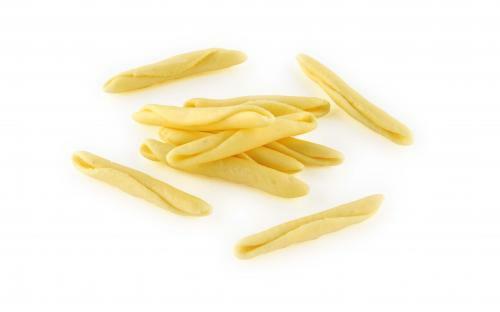 This pasta of Italian origin is tubular in shape, and is cut short and bent into a curl. Torchietti is most often paired with bolognese or sausage sauces. 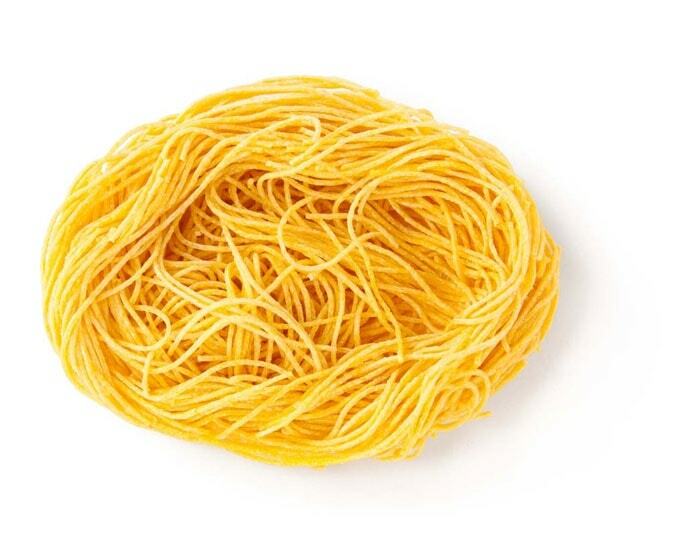 If you can imagine a smaller, thinner version of spaghetti, that’s basically what spaghettini is. Among the many types of pasta and a native of Italy as well, spaghettini falls somewhere between spaghetti and vermicelli on the thickness scale, and is commonly served with tomato-based or olive oil-based sauces. 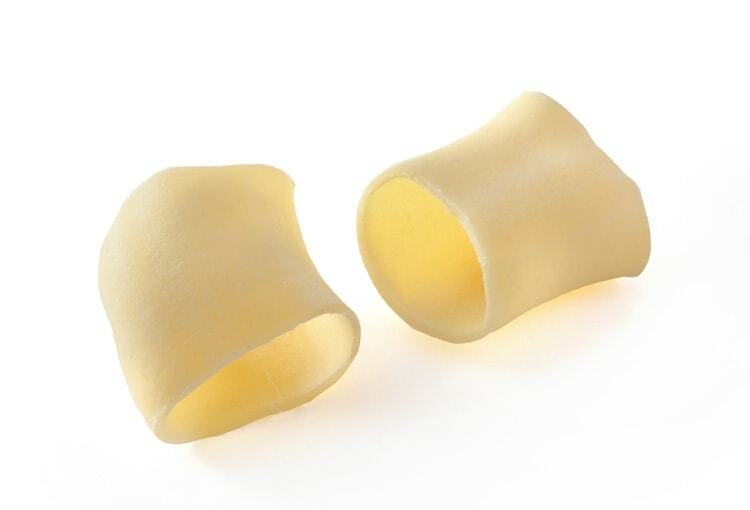 This thick, ring-shaped pasta hails from Naples, and is commonly confused with calamari rings due to its similar appearance. Calamarata belongs to the Paccheri types of pasta due to its tubular shape, and it pairs very well with heavy cream sauces or seafood pasta recipes. Tonnarelli is known to some as the square spaghetti. For many, however, it is perhaps more aptly known as the Roman version of spaghetti alla chitarra from the Abruzzo region. After all, tonnarelli can be made pretty much the same way as you would spaghetti alla chitarra. That is, you use the same fresh pasta dough recipe, roll the dough sheet about the same thickness, and cut the pasta dough using a tool with strings called a chitarra. Interestingly, you may also use a striated rolling pin for cutting the dough and it will pretty much give you the same results. 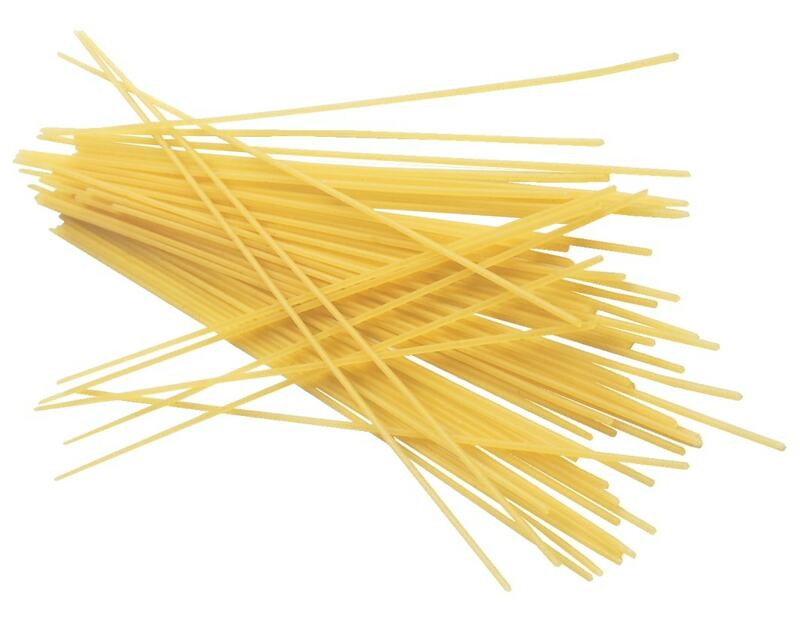 So technically, tonnarelli and spaghetti alla chitarra are basically the same pasta, only with different names, depending on where you are. If you’re in Abruzzo, you call it spaghetti alla chitarra, but if you’re in Roma, you call it tonnarelli. 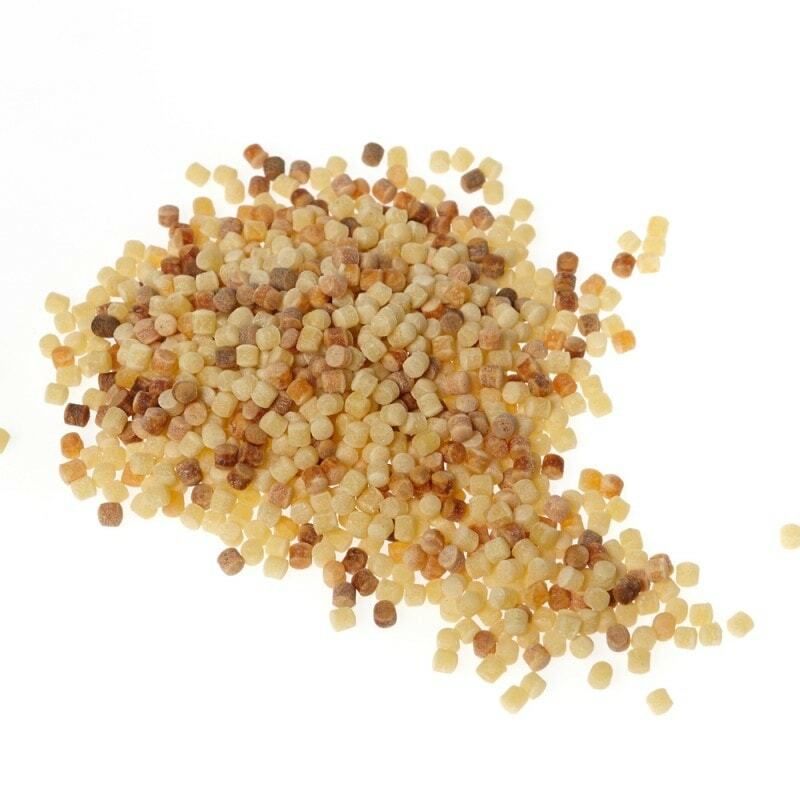 Literally meaning “peppercorns” in English, acini di pepe may look like couscous, but it’s actually a type of pasta that just look like tiny grains. In fact, some people call them pastina, which means “tiny dough”. It is usually cooked like grains but its cooking time is only 4 to 9 minutes. 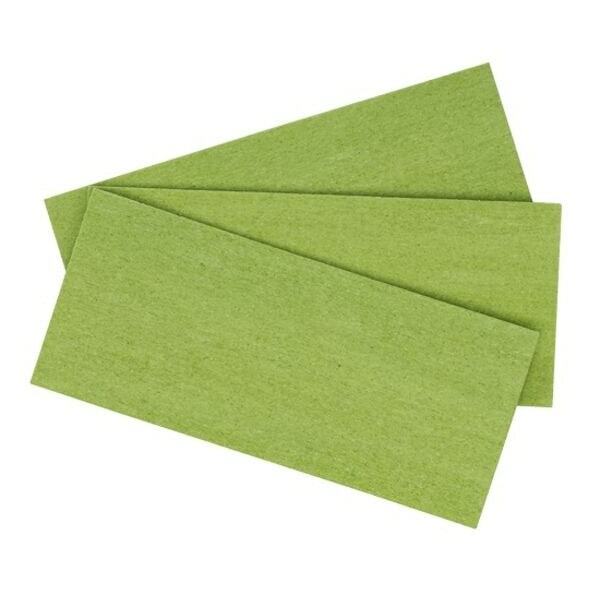 It is commonly used for soups and salads, and it is often the preferred ingredient for Italian Wedding soup. Capelli d’angelo, a.k.a. 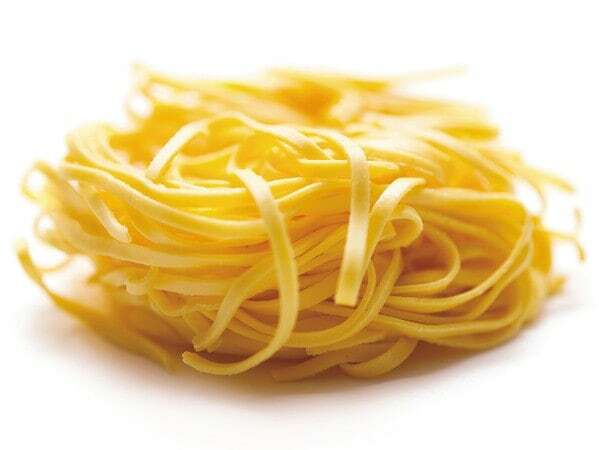 angel hair, is a type of string pasta like spaghetti. 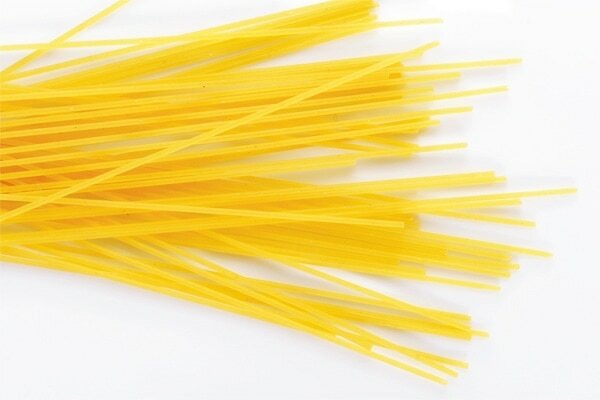 Unlike spaghetti, however, it’s commonly very thin, around 0.031 to 0.035 inches in diameter. It is often used for soups and seafood dishes, or with light sauces. Its cooking time is around 2 to 4 minutes and is often sold in coils that look like bird’s nest. 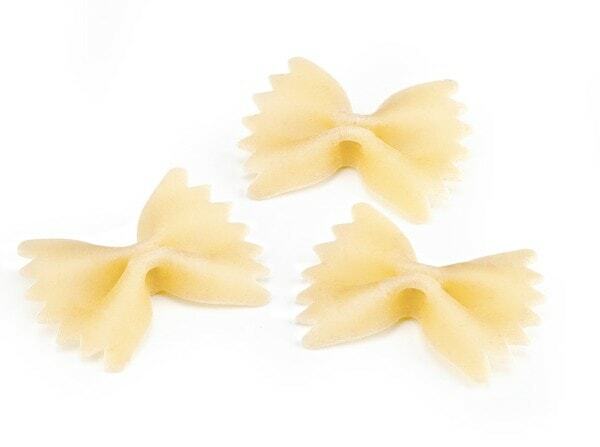 It is one of the classic pasta shapes and has been a popular pasta in the Italian peninsula since the 14th century. 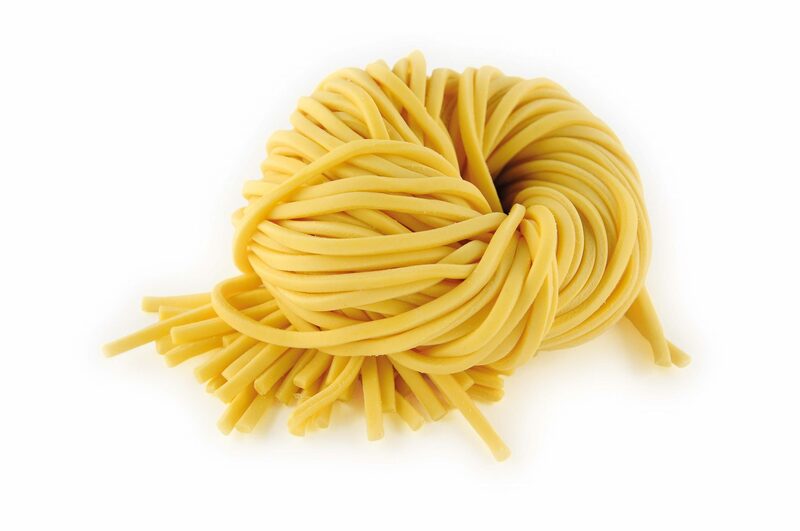 A slightly thicker pasta than angel hair, cappellini is often mistaken for angel hair. This is probably because they’re both thin, delicate string pastas that are often used in soups or with light sauces. 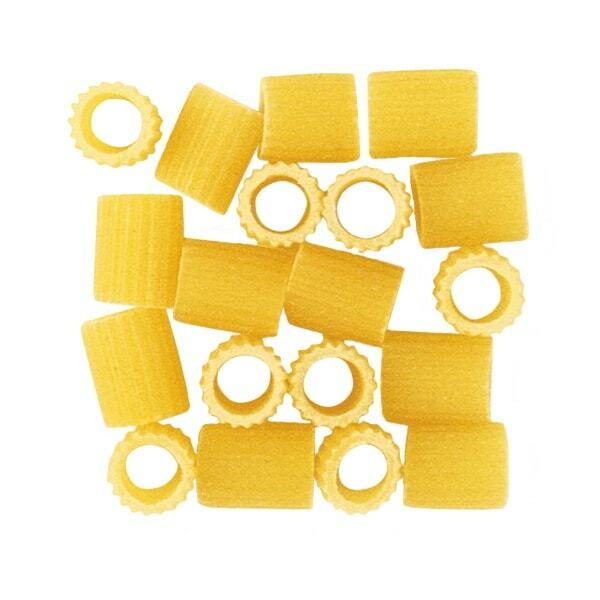 Despite the similarities, however, cappellini is actually considered a different pasta. Its diameter usually measures between 0.033 and 0.036 inches, and its cooking time is around 2 to 6 minutes. 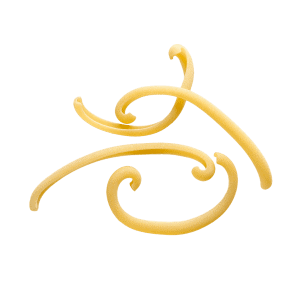 Filei calabresi, or simply filei, is a type of short spiral pasta that has a hollow part in the middle. The shape is usually made by rolling irregularly shaped pieces of dough using a thin knitting needle, making a hollow part in the middle. It is often compared to busiate, but they don’t actually look the same. 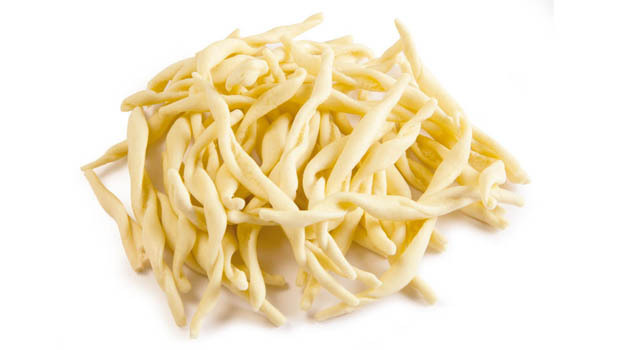 Busiate is clearly spiral-shaped while filei is more like a narrow and more elongated version of cavatelli. Also, busiate is typical of the city of Trapani in Sicily while filei is typical of the Calabria region. 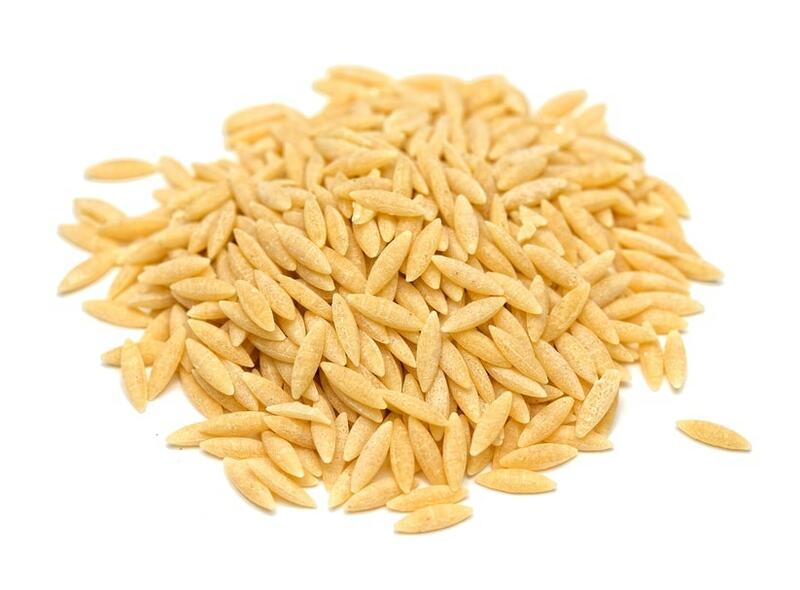 Orzo is actually the Italian word for “barley” and because of this, many people mistake this pasta shape for the actual grain. To add more confusion to mix, the pasta shape resembles large grains of rice, which also looks a bit similar to barley grains. This is probably why (perhaps to lessen some of the confusion) this pasta shape also goes by another name, which is risoni, meaning “big rice” in Italian. Orzo pasta is not typical to a specific Italian region and is most often used for salads, soups, and baked casseroles. One of the popular Italian dishes you may find orzo in is minestrone. 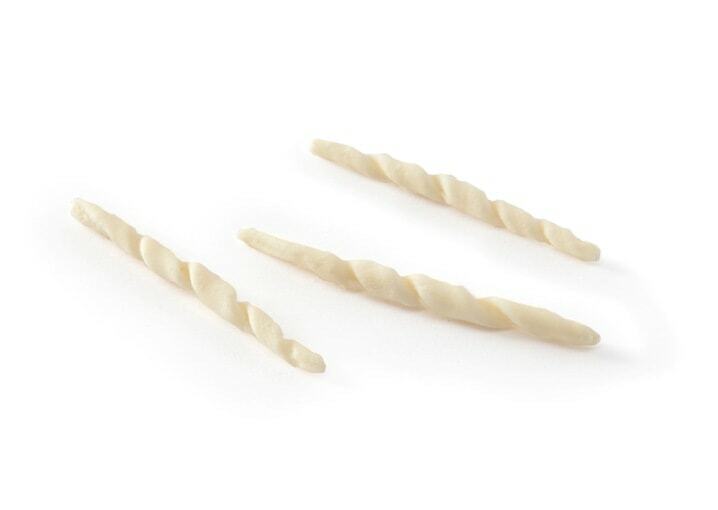 An Italian word that literally means “tiny dough” or “little pasta”, pastina is a pasta variety that consists of tiny pieces that may resemble grains but could actually be any shape. As a matter of fact, acini di pepe is also called pastina by some. Pastina is made of wheat flour and sometimes, also eggs. The typical size for each piece is usually a quarter of an inch or smaller. 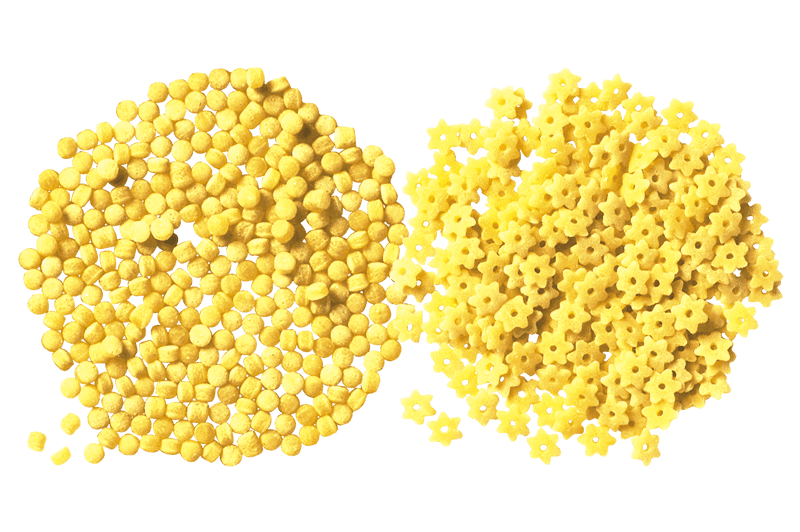 Some of the most common pastina shapes are tiny stars, shells, tubes, and macaroni. Much like orzo, pastina is most often used in soups and salads. Other names for pastina are pastini and pastine. A pasta typical of the Apulia and Basilicata regions, troccoli is a type of string pasta like spaghetti. However, its cross-section is shaped either like an oval or square, like spaghetti alla chitarra. In fact, it has often been compared to spaghetti alla chitarra. This is not only because of its shape, but also because of the tool used to make them. Troccoli is made using a striated rolling pin called a troccolo or a troccolaturo. 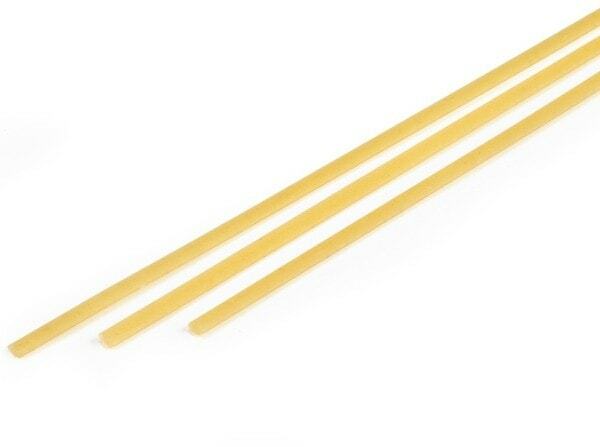 Spaghetti alla chitarra, on the other hand, is made using a special wooden board with strings called a chitarra. 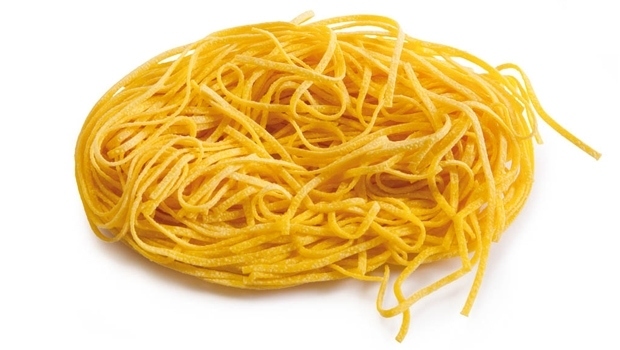 However, since the square troccoli pasta looks pretty much like spaghetti alla chitarra, you can probably use either tools to make either of the two pastas. Just remember that if you’re in Abruzzo, it’s spaghetti alla chitarra, but if you’re in Apulia or Basilicata, it’s troccoli. It’s a type of pasta that can only usually be found in Trapani, which is an area in Western Sicily. 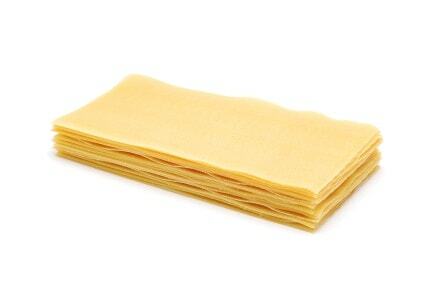 It is made of durum wheat flour and water, just like most fresh pasta in southern Italy. 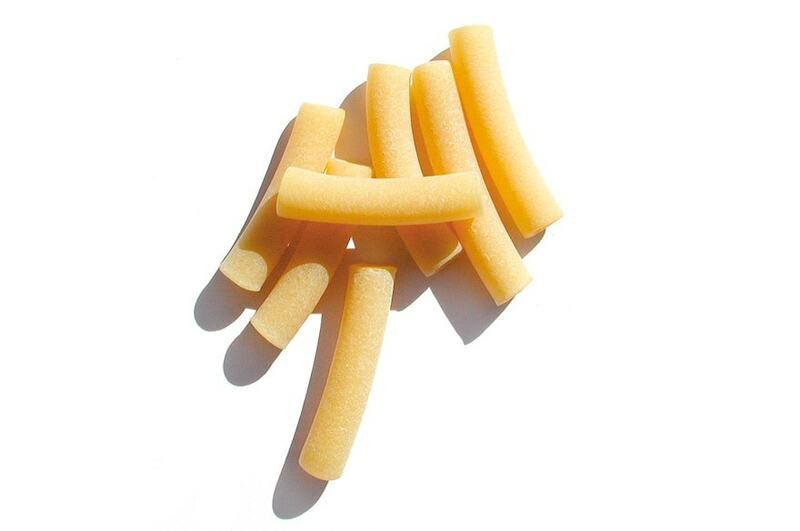 The pasta’s name comes from the word “busa”, which is a thin stick from a type of grass that grows in dry sandy soil. Makers of busiate in the past turn the dough into corkscrew shapes using the “busa” stick. Today, many use a special metal wire or a knitting needle to make them. Dried busiate is also available in the market but most families in Sicily prefer using the fresh ones, which are often homemade. Busiate is best used with the famous pesto alla Trapanese sauce, as well as fish-based sauces, which is quite popular in seafood-rich island of Sicily. Here’s another variation of the classic lasagne. Prepared with spinach, which is added when the dough is being made, lasagne verdi are traditionally prepared and served with ragú alla Bolognese, but more recently they can be found in vegetable based lasagnas as well. They are usually found in the Emilia-Romagna region. Originating from Sicily, spaccatelle is not widely used in other parts of Italy. It is a short pasta with a spaccatura, or split, down the center and is commonly served with vegetable sauces like alla Norma or seafood. Campanelle means “bellflowers” or “little bells,” and true to its name, this is a bell-shaped pasta with fluted, petal-like edges. With a hollow center perfect for holding sauce, this pasta shape pairs well with thick, chunky sauces. Known as “penne lisce” in Italy, Mostaccioli originate from the Campania Region of Southern Italy. 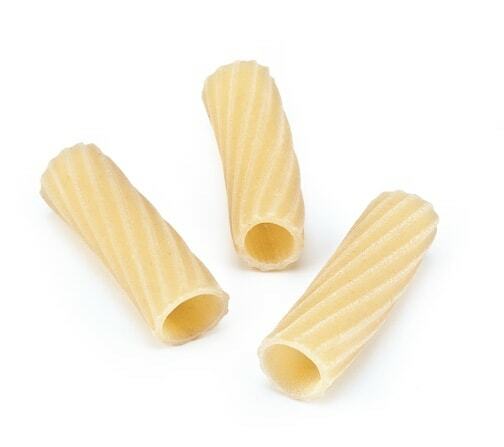 It has a tube shape with angled ends like the more well-known penne pasta, but with a smooth texture instead of ridges. Mostaccioli is best served with fresh, light sauces or in casseroles, called pasta al forno in Italian. 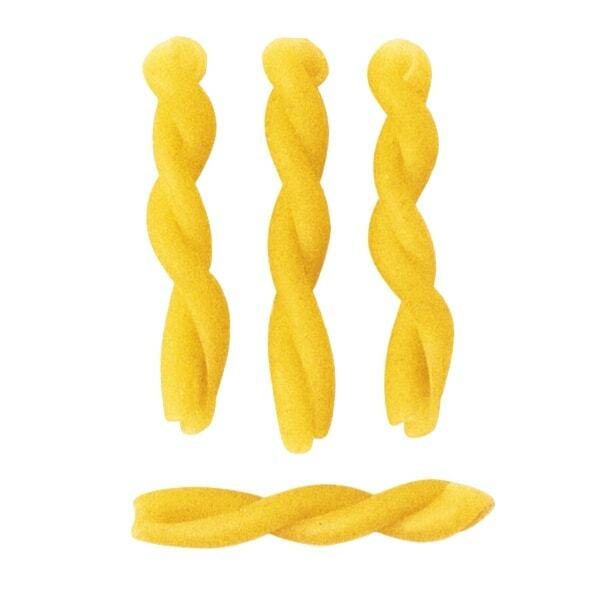 Gemelli, Italian for “twins,” is a short pasta made up of two strands of pasta twisted together. This versatile pasta shape works well in pasta salads, casseroles, or light tomato, oil, or dairy-based sauces. 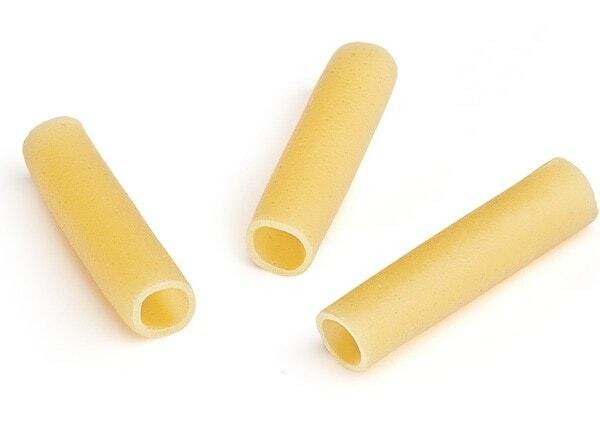 Radiatori is a small pasta with textured, wavy lines that make it look like a radiator. Its size and texture make it perfect for thicker sauces, soups, salads, and casseroles. Casoncelli come from the town of Bergamo in Lombardy, a region of Northern Italy. This large filled pasta is typically made with fresh pasta folded over meat or a mixture of meat, cheese, raisins, or other ingredients and pressed together to resemble wrapped candy. It is usually topped with a simple sauce of melted butter, pancetta, and sage leaves. So, tell us: Did we miss a pasta? Which type of pasta is your favorite? How do you prepare it? Let us know in the comments! You left out orzo, Cappelli night, angel hair. Mafalda, pastina, and orzo were left out. 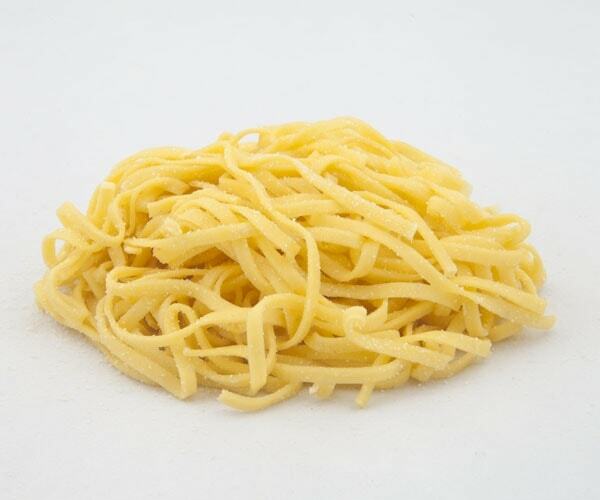 You miss Tonnarelli , pasta Made in Rome , used for Cacio&Pepe recipe! Seems is tasting good, should I have a picture of it? 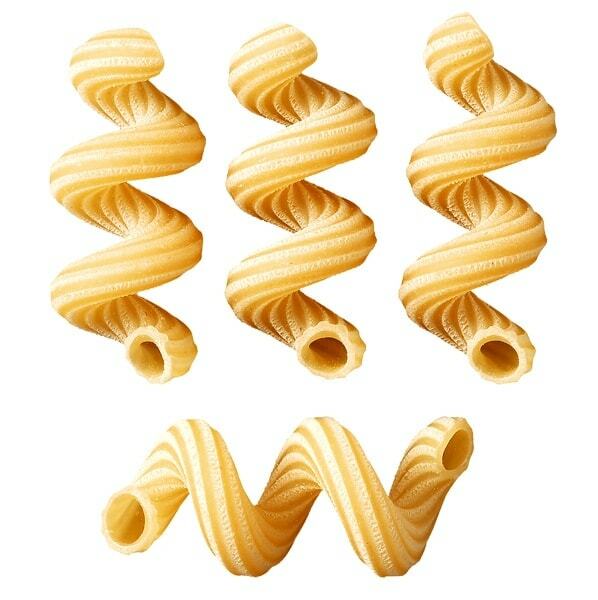 My mouth is watering, after viewing the pasta shapes. They’re all there. Look closer. I couldn’t remember the correct name and can’t find it in CA…had it in a restaurant in Salemi, Trapani, Sicily with eggplant and crumbled sausage…fabulous!!! Thank you Gina(who gave me your list) and Nonna! I have been served a pasta that resembled a clock spring. Itheld the sauce superbly. Do you havea name for it? Your info on penne rotate is inaccurate. It is not a stuffed pasta but rather, is more like a ziti, eaten with sauce. Unless I missed it, you forgot gemelli. Wow. There are haters…even on a pasta site! The internet has been the death of civility…. Haters?? All I see is people pointing out pasta that wasn’t in the article. I sure didn’t see anyone being nasty about it. It seems you see anger even when it’s not there. Chill out! They missed one I was looking for information about, bucatini rigati. No big deal, there are innumerable kinds of pasta, and they can’t put them all in. I think manicotti is the Italian-American version of Italy’s cannelloni just like fettuccine is the Italian-American version of Italy’s tagliatelle. Hi Kazy – Thanks for stopping by. Cannelloni is a smooth and rounded pasta tube, while manicotti is usually a ridged tube. Fettuccine and Tagliatelle are very similar, however there’s a difference: fettuccine are slightly narrower than tagliatelle. I just had tagliatelle, last night with a seafood type sauce; my daughter said it was fettuccine; I disagreed! What a great set of information you have supplied here. Thanks! What do you call the cartoon or animal shaped pasta?? The ones for children? Hi Natasha! To be honest with you I have never seen this type of pasta in Italian grocery stores. But I did a quick search online and found it. Though not every pasta brand makes it and has it in its line of pasta, but you can search for “pasta animali della fattoria”. Hope this helps!! In defence of everybody answering, the author requested for people to fill in the blank. Thank you so much for compiling this list; it’s exacting what I was looking for! Gotta save this list…. Try different types of pasta with different sauces!! Love it! This truly expanded my knowledge of pasta shaped, and opened my eyes to the beautiful world of Italian cuisine. Thank you so much for compiling this extravagant list! Don’t let the haters ruin your quickly progressing career in pasta naming. FRICK THEM YOU SPAGHETTI QUEEEEEEEEEEEN. DO NOT LISTEN. PASTA IS BAE. PASTA IS LOVE. PASTA IS LIFE. PRAISE BE TO PASTA. I’ve been all over Europe and Asia. There are a million pastas and numerous varities within each type. Ingredients, prep and size differ from region to region, and even village to village. Everyone swears their pasta is made the proper way and that it’s the best … and I have to agree. They’re all the best. Fabulous List with great pics Nonna Box. Thanks for giving me more ‘heaven’ to explore. It’s true Daryl, can’t wait to go back to Italy and try the most of them again! Thanks for stopping by! My grandma made a stuffed pasta that I cannot find any reference for. The pronunciation was “ tutclatch”. She and my father have passed and I’d love to hear if you have any idea what the proper name might be. Thank you. Hi Jayne – Thank you for stopping by. I’d love to learn more about the type of pasta you are mentioning, could you give us some more details like, from which part of Italy were your parents from originally? I’d like to help you with the research! I recently attended a party on vacation and the pasta dish was made with a very large fusilli. Does this pasta have a special name and where could I purchase it? Hi Robert – there are a couple of pasta shapes that are names ‘fusilli’ – do you know if they were made with durum wheat or flour and water? I’d love to help!